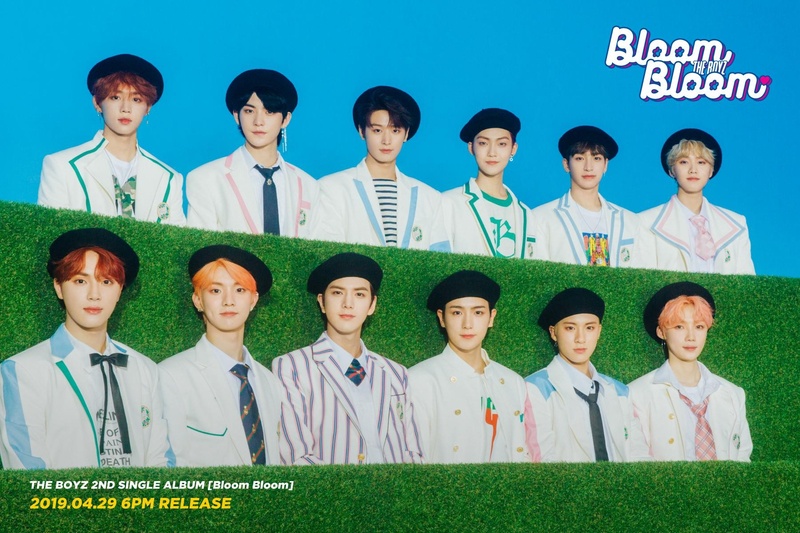 The Boyz (더보이즈) is a 12-member South Korean boy group under Cre.Ker Entertainment. 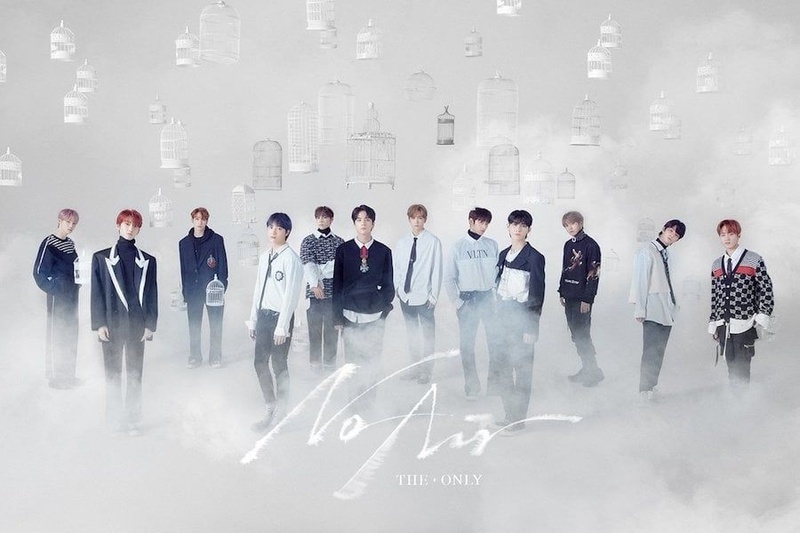 The group consists of Sangyeon, Jacob, Younghoon, Hyunjae, Juyeon, Kevin, New, Q, Juhaknyeon, Hwall, Sunwoo, and Eric. 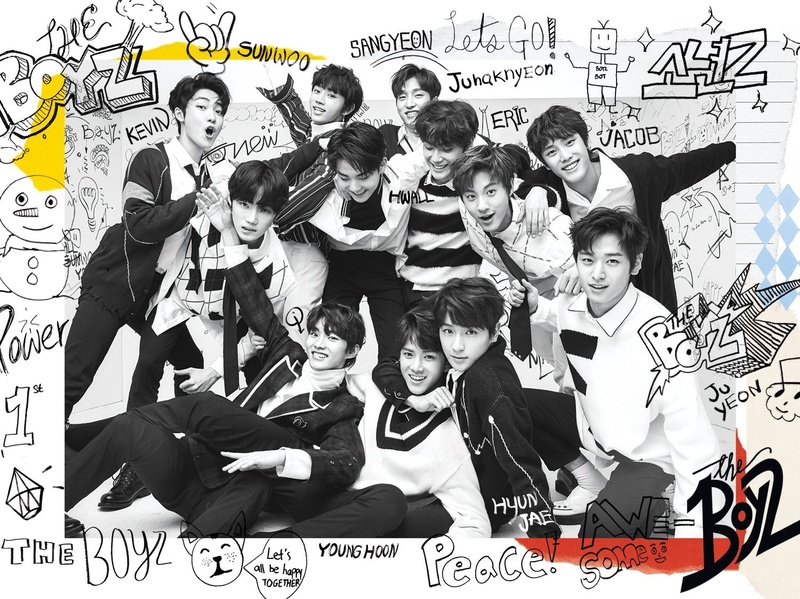 The Boyz debuted on December 6th, 2017. – His representative number is 82. – His English name is Jayden Lee. – Sangyeon likes to make fried rice balls. 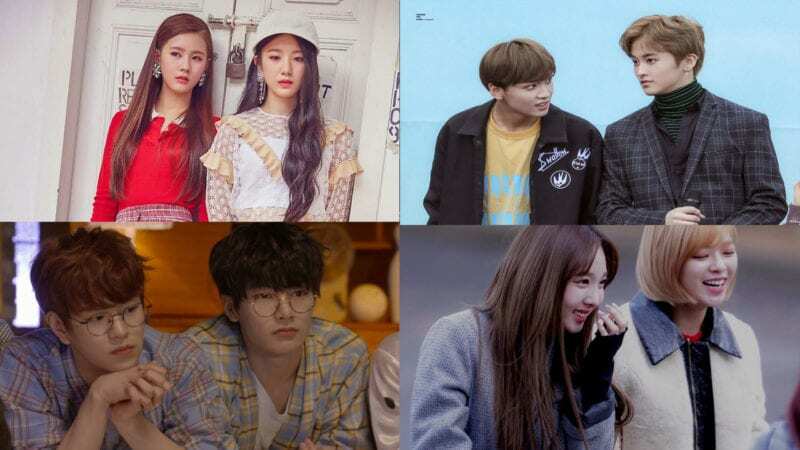 – Sangyeon, Juyeon, Hyunjae, Haknyeon appeared in Melody Day‘s “You Seem Busy” MV. 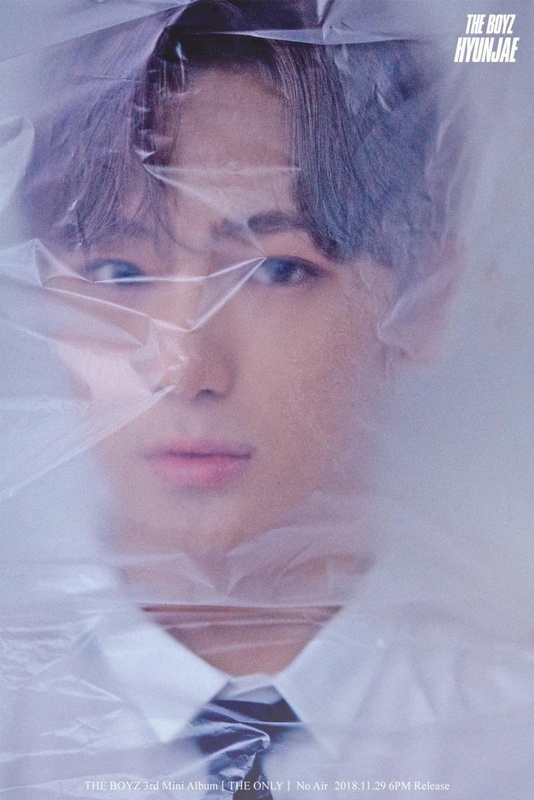 – Sangyeon is friends with JBJ’s Longguo. – He was born in Toronto, Canada. – His representative number is 30. – Younghoon has an older brother. – His representative number is 67. – His English name is Jelly Kim. 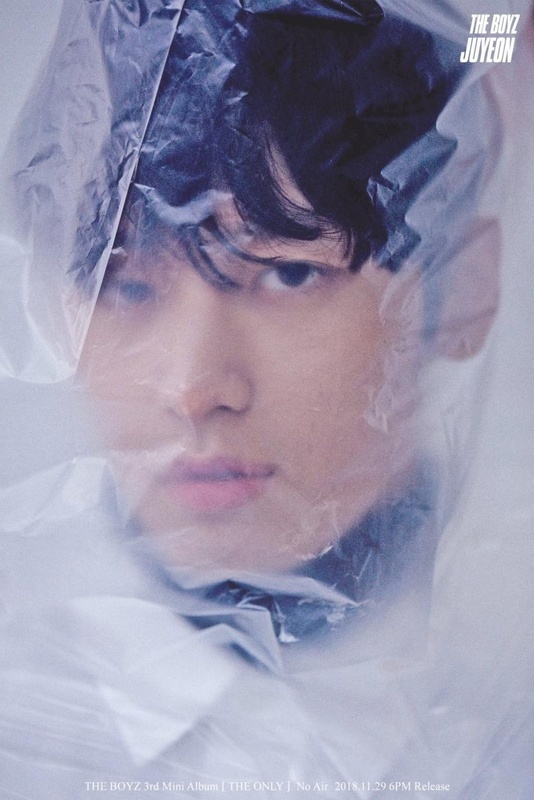 – Younghoon modeled for “Paul Miranda Italy Pictorial”. 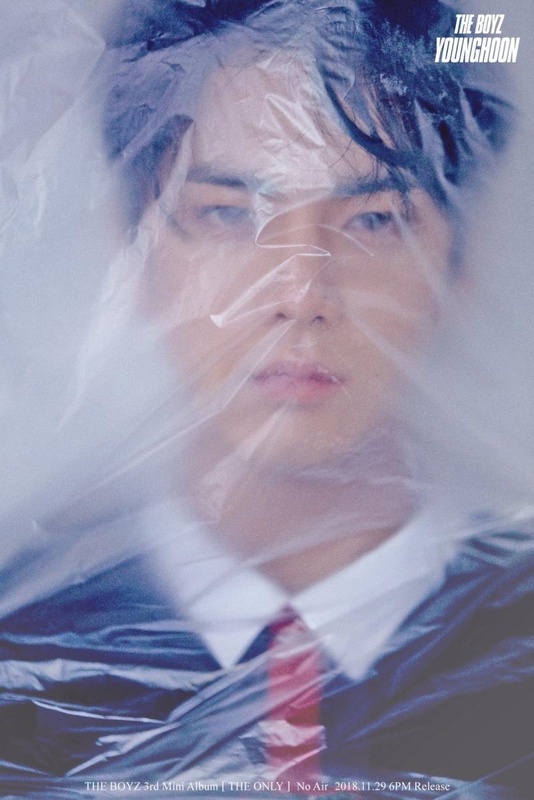 – He appeared in I.O.I‘s “Whatta Man” MV. – Hyunjae is from Incheon, S. Korea. – Hyunjae has an older sister. – His English name is Jerry Lee. – His specialty is also playing sports. – Hyunjae, Juyeon, Sangyeon, Haknyeon appeared in Melody Day’s “You Seem Busy” MV. – He went to Seoul Samyook High School. 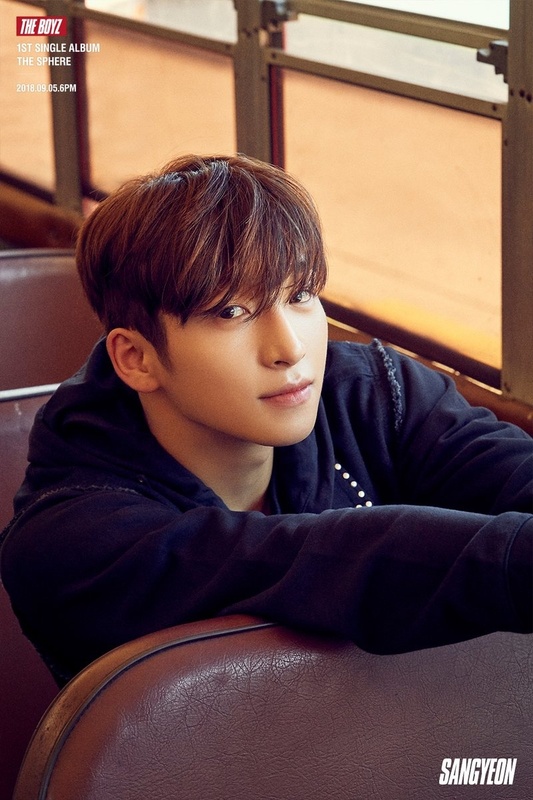 – Juyeon was part of the student committee president in elementary school. – He went on a trip with his family and he was watching a performance one night and a casting director came up to him and gave him a business card, that’s how he got casted. 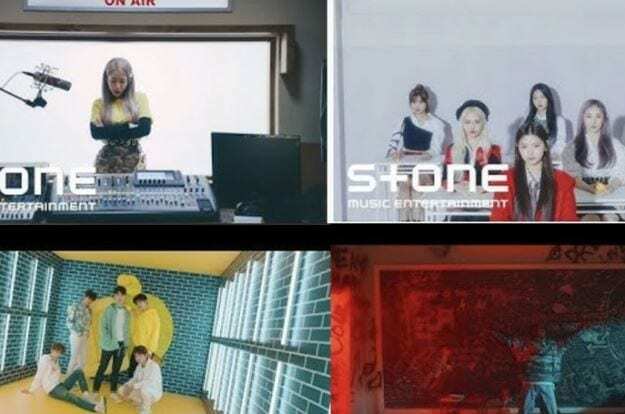 – Juyeon, Hyunjae, Sangyeon, Haknyeon appeared in Melody Day’s “You Seem Busy” MV. 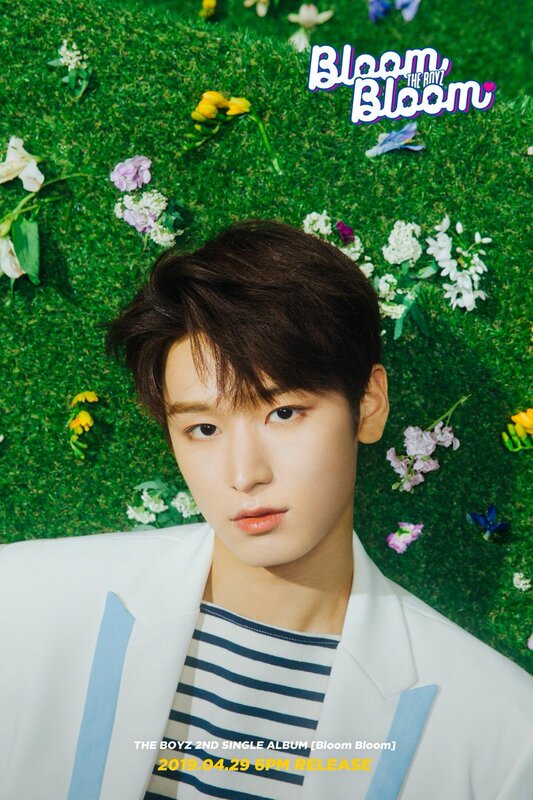 – According to Q (in ‘Flower Snack’), Juyeon is “deceptively” innocent and very gullible. 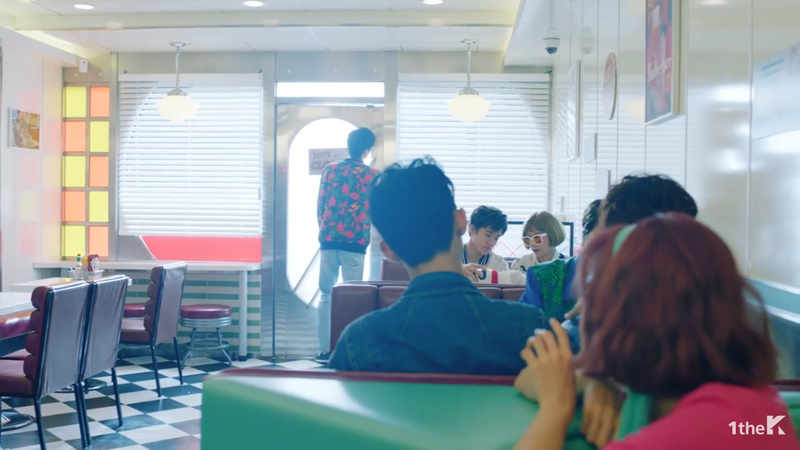 – He appeared in MelodyDay‘s “You Seem Busy” MV. – Kevin is from Vancouver, Canada. – Kevin went to Burnaby Mountain Secondary School. – He is very good at drawing (he designed the group’s logo). 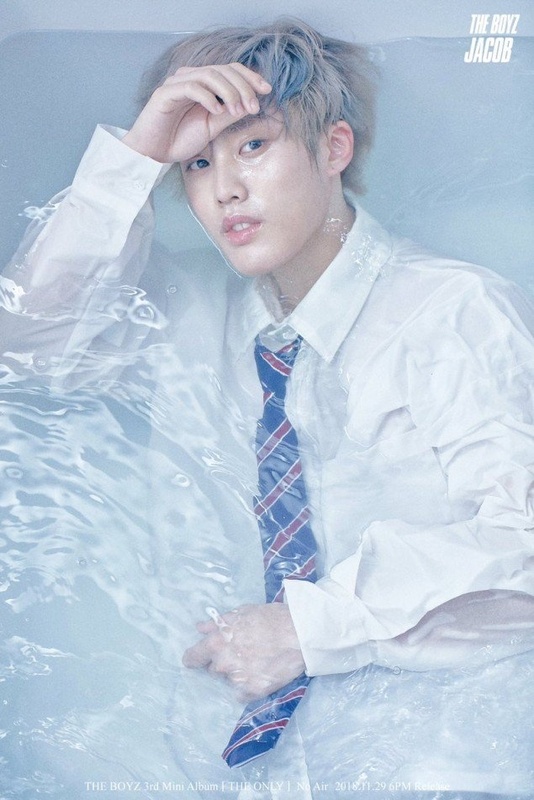 – He was a contestant on Kpop Star 6. 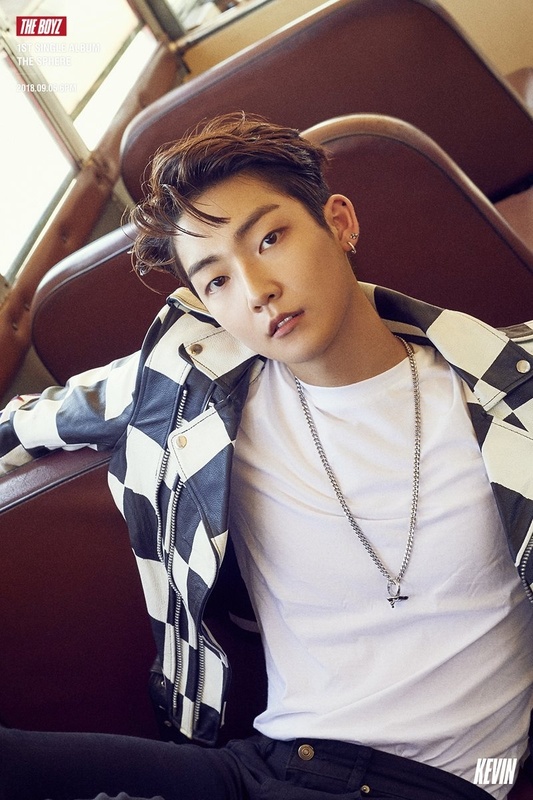 – Kevin is a huge fan of Sam Kim and Beyonce. – He plays the piano (since middle school). – New has an older brother (10 years older than him). – His representative number is 98. – His English name is New Choi. – Q has two older sisters. – His representative number is 02. – His English name is James Ji. – His hobbies include watching Spongebob and horror movies. – He loves horror movies. 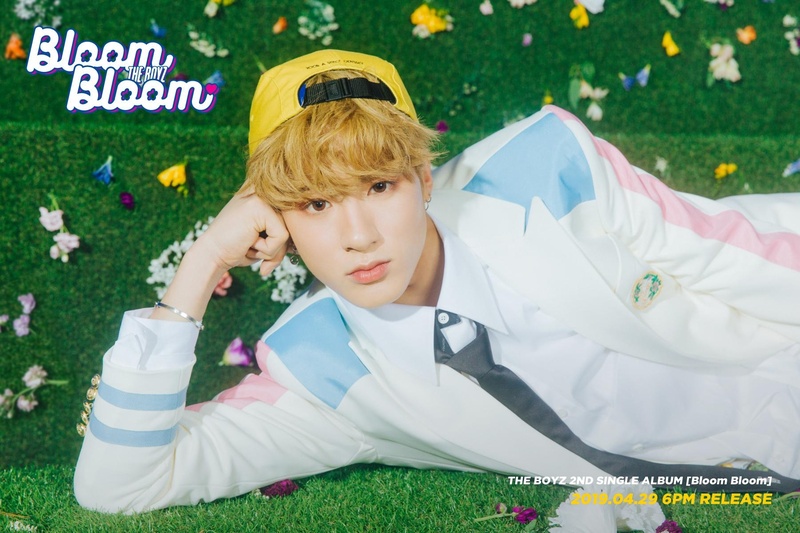 – Q says his charm points are his dimples and his reversal from cuteness to powerful dancing. – Q’s favorite color is blue and sky blue. – Q is known for his high-pitched “dolphin” screams. – Q’s ideal type: Someone similar to his mother. – Haknyeon is half Chinese (Hong Kong) and half Korean. – He lived in Hong Kong for a while. – He has an older sister and younger sister. – His representative number is 09. 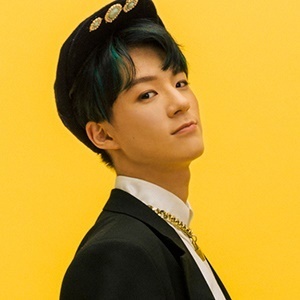 – His English name is Brian Ju. 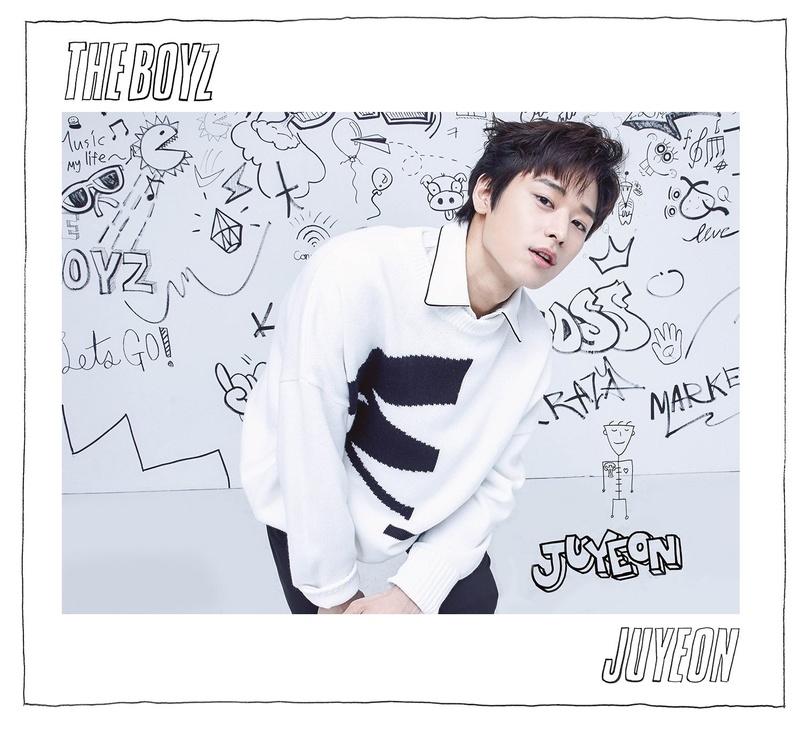 – His nickname is Jeju boy. 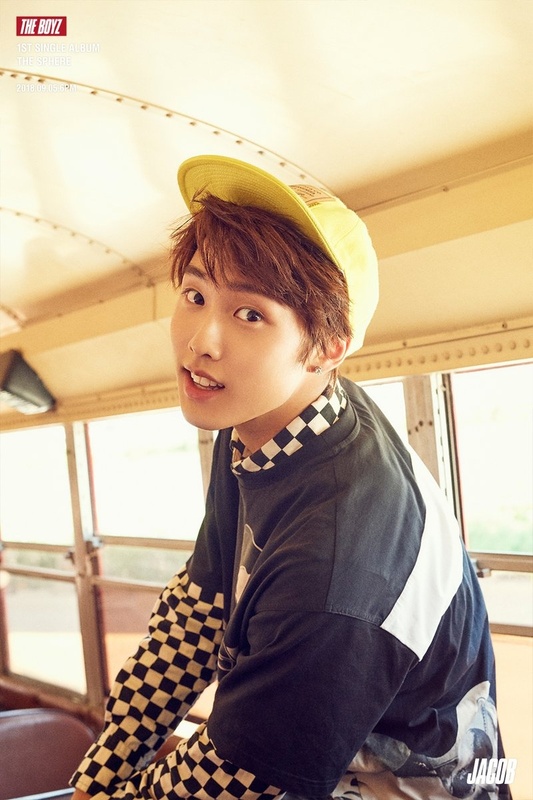 – His hobbies include skiing and playing badminton. – His specialty is speaking in Mandarin. He can also speak Cantonese. – He really likes to enjoy good food. – He hates horror movies. – Haknyeon’s favorite color is white. – Haknyeon does radio broadcasts on Vlive which he calls “Tangerine radio”. 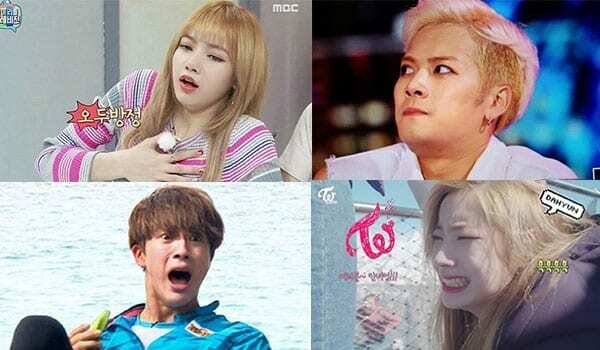 – He, Hyunjae, Juyeon, Sangyeon appeared in Melody Day’s “You Seem Busy” MV. – Haknyeon’s ideal type: A person who has a kind heart. – He is from Busan, South Korean. – Hwall has a younger sister (4 years younger than him). 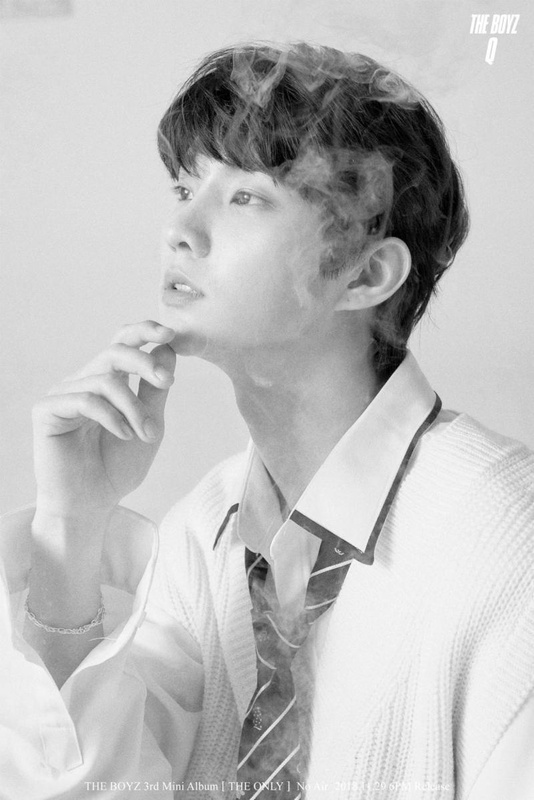 – Hwall’s father passed away on February 4th, 2019. 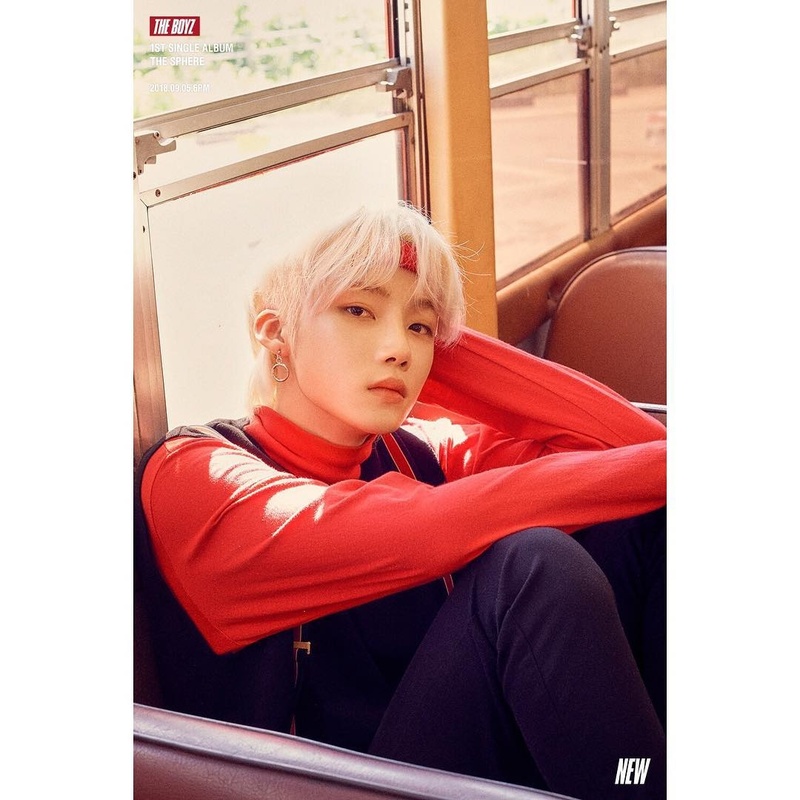 – Hwall is a sophomore at Hanlim Art High School. – Hwall lived in the Philippines for four years. – His English name is Leo Heo. 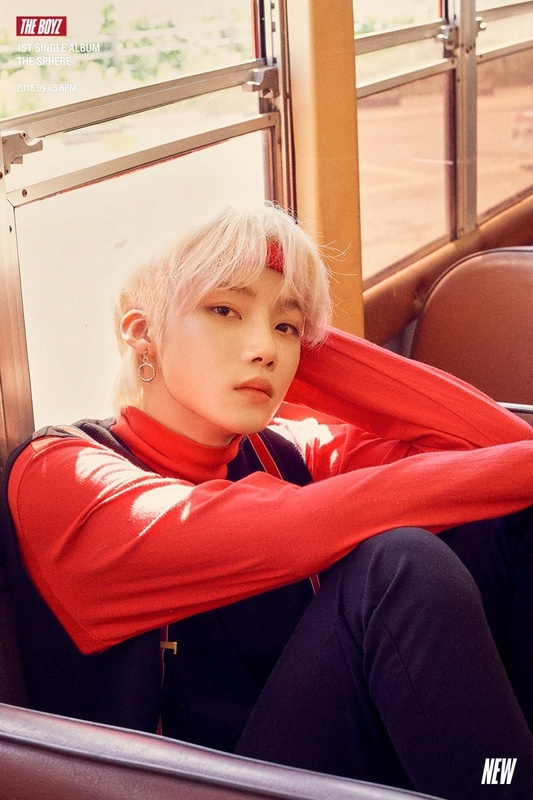 – Hwall is in charge of fashion. 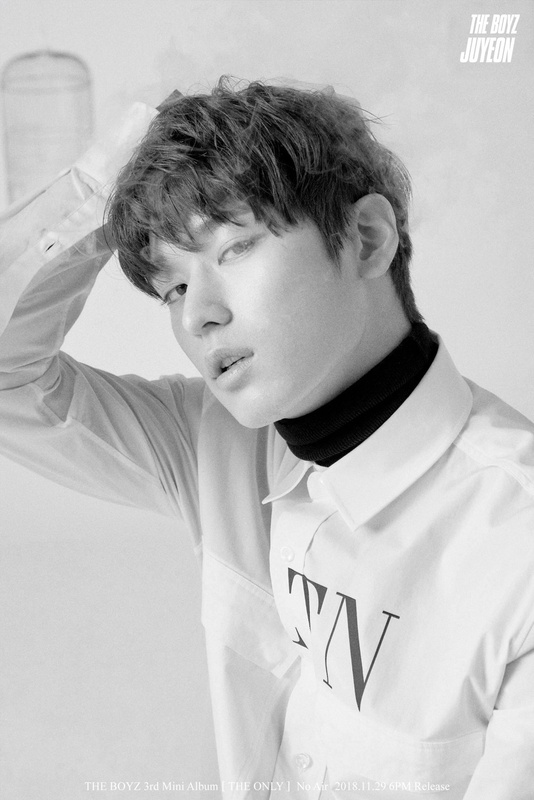 – His hobby is horseback riding, acrobatics, modern dance. – Hwall thinks his charming point is his wink. 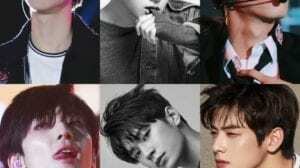 – He’s close to Golden Child‘s Bomin and to Yoo Seonho (they were school mates). 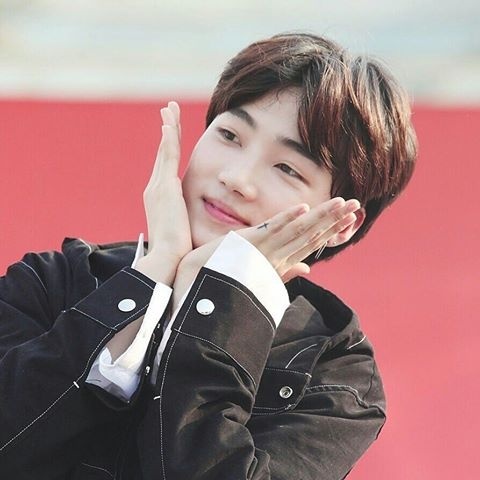 – Sunwoo has a younger sister. 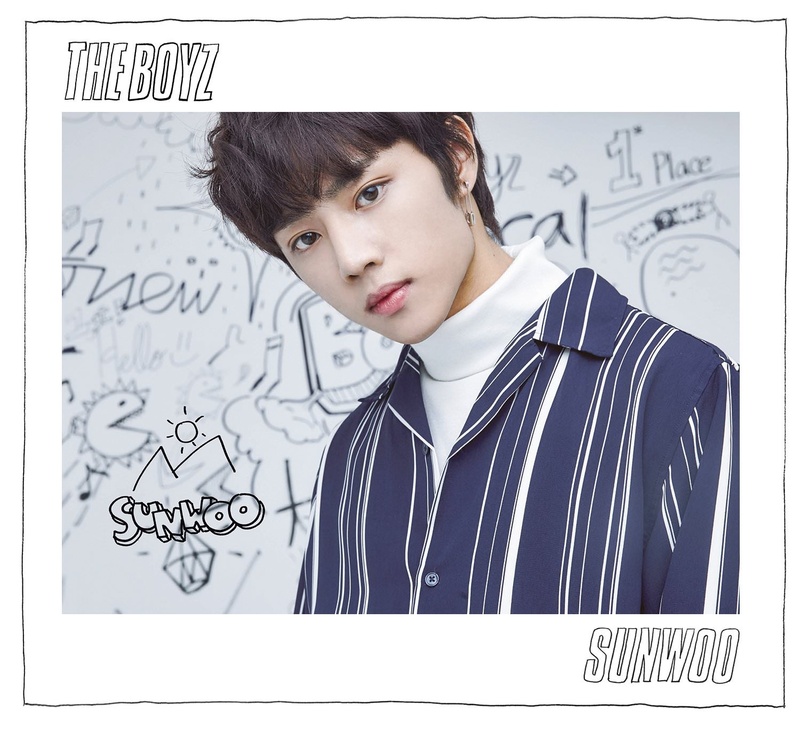 – Sunwoo is a sophomore at Hanlim Art High School. 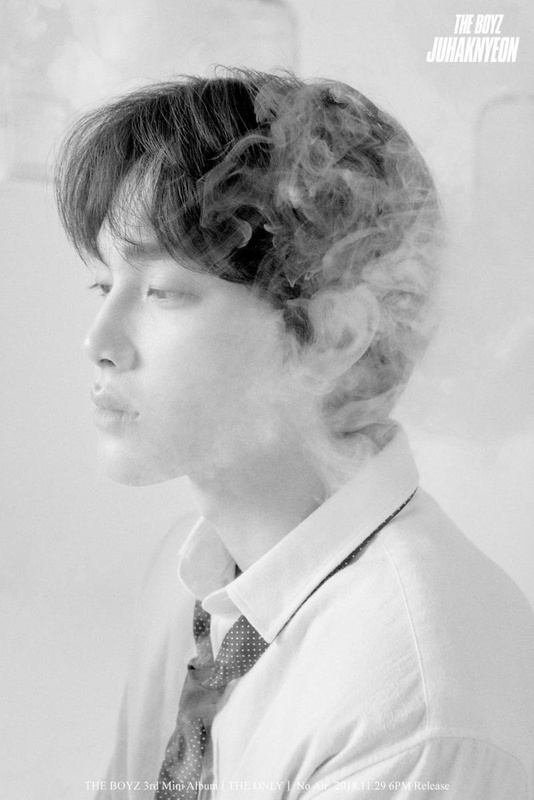 – His nickname is Seonoo. – His representative number is 19. – His English name is Joe Kim. – His hobby is to watch movies. – Sunwoo is very mature for his age. – He loves the anime ‘Kimi no na wa’. – Sunwoo was a former soccer player (4 years). – His special talent is fast rapping. – He was on Mnet’s High School Rapper. 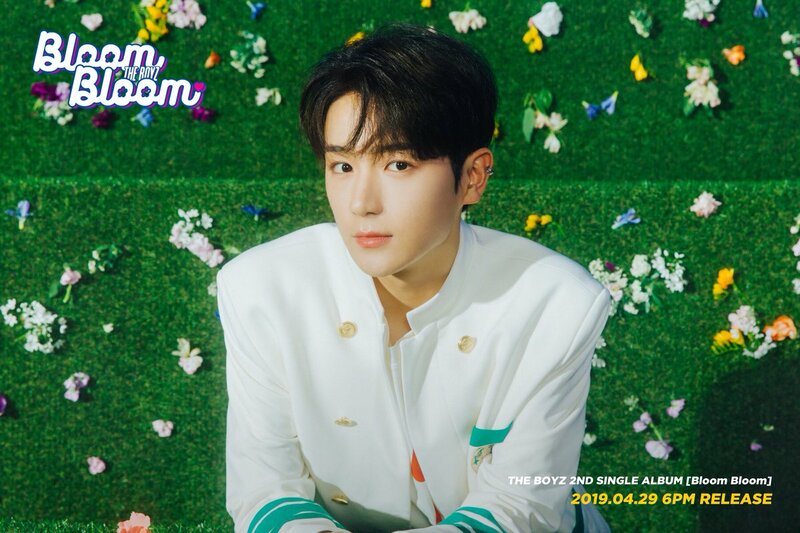 – Sunwoo stated that his closest idol friends are Astro’s Sanha, Golden Child’s Bomin, and Lee Daehwi. – Sunwoo’s ideal type: Someone that likes him. 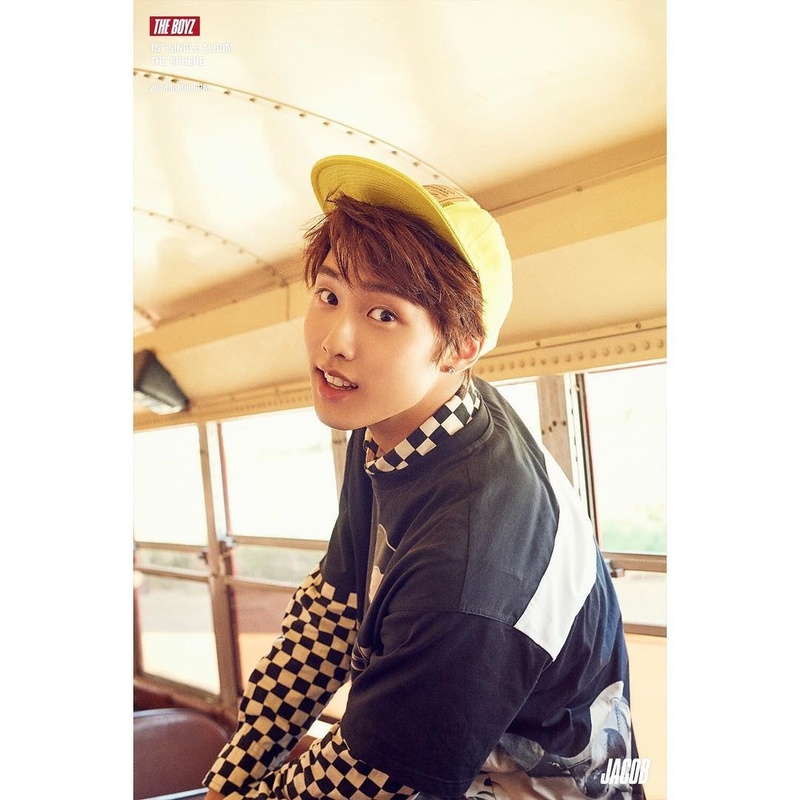 – He was born in South Korea but grew up in Los Angeles, California, USA. – His representative number is 22. 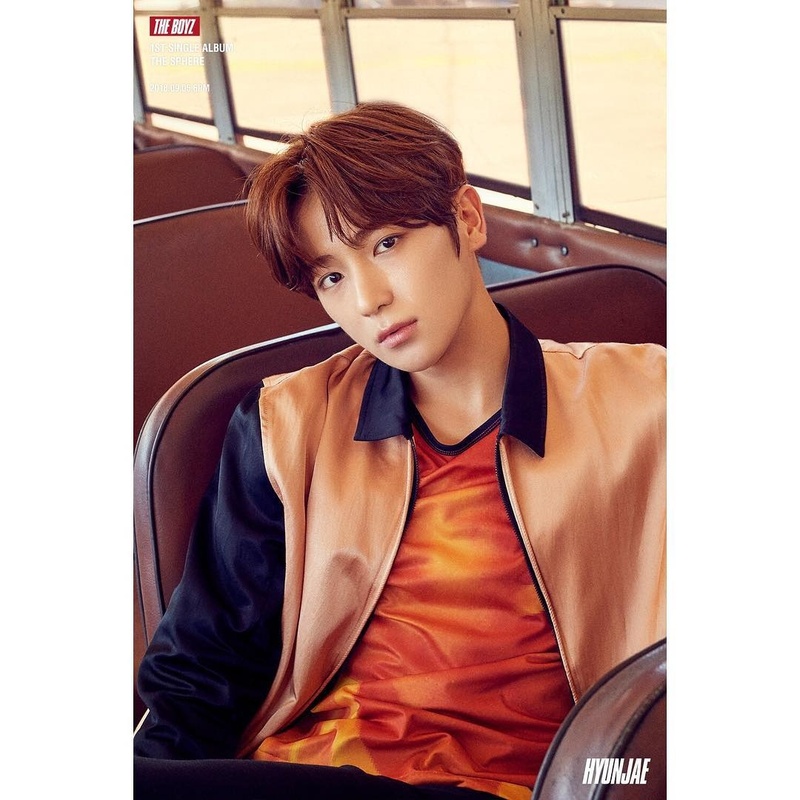 – His hobbies include playing sports, watching movies, dancing, and skating. – His specialty is playing baseball and solving Rubix cubes. – Eric is a huge fan of GOT7. – Eric’s ideal type: A girl full of charms. 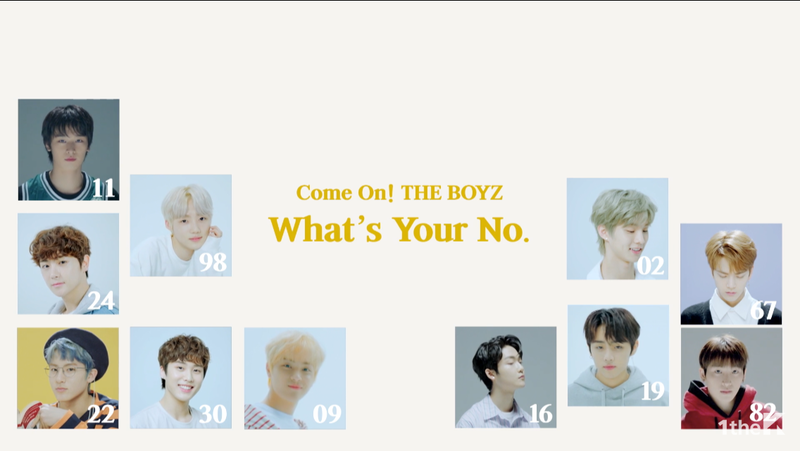 Who is your The Boyz bias? Juhaknyeon has a pig named Ggul. He likes Mango juice also. He really likes to enjoy good food. 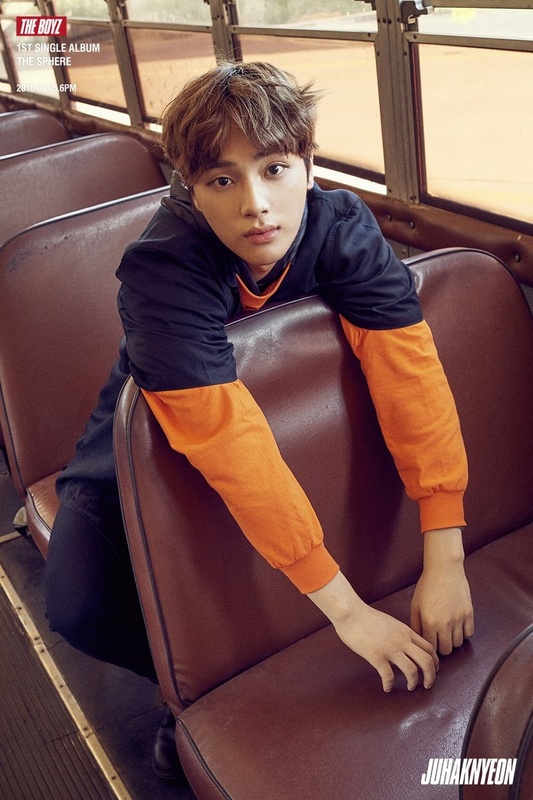 His name (Joo Haknyeon) means: Joo: around Hak: learn and Nyeon: year. He is close to Seon Woo. He doesn’t like pork that much. Sometimes Juhaknyeon picks out his outfits but most of the time his stylist Soo Kyung picks out his clothes. He can speak Cantonese. When he becomes 20 years old he wants to drive. His dream is to go to Europe when he is 50. Juhaknyeon is 175 cm tall now. Eui Woong is his best friend. He doesn’t like dressing up in layers. 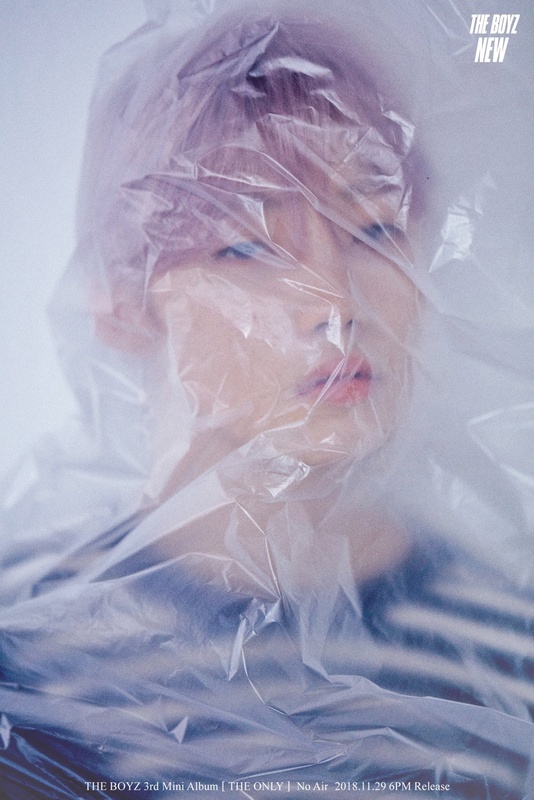 Jung Jihoon is his singer role model but he likes Rain a lot. He likes Jinwoo the most out of the PRODUCE 101 members. He is very close to Yong Guk. Some time in late 2017. According to Q (in ‘Flower Snack’), Juyeon is “deceptively innocent (contrary to his looks) and very gullible! Before New was a trainee he did a lot of part time jobs, at a Grill restaurant, a fish restaurant, so many that he lost count. He is a very experienced waiter/food industry employee (as he explained in ‘Flower Snack’). Juhaknyeon trained for two years and one month. Juhaknyeon’s last words on Produce 101 were “I will do my best and better than anyone else”. He experienced mnet’s evil editing which made him look greedy and showed him making mistakes on stage. Juhaknyeon goes to Hanlim art school. His name is Jeju boy. 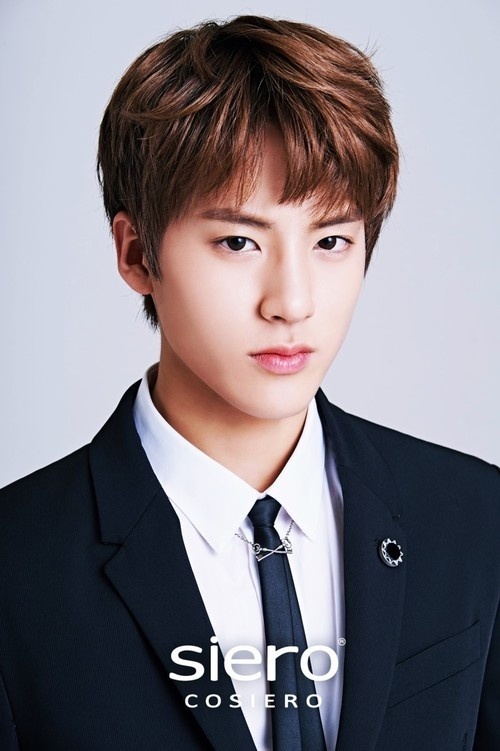 Hyunjae graduated from HanLim Art High School. 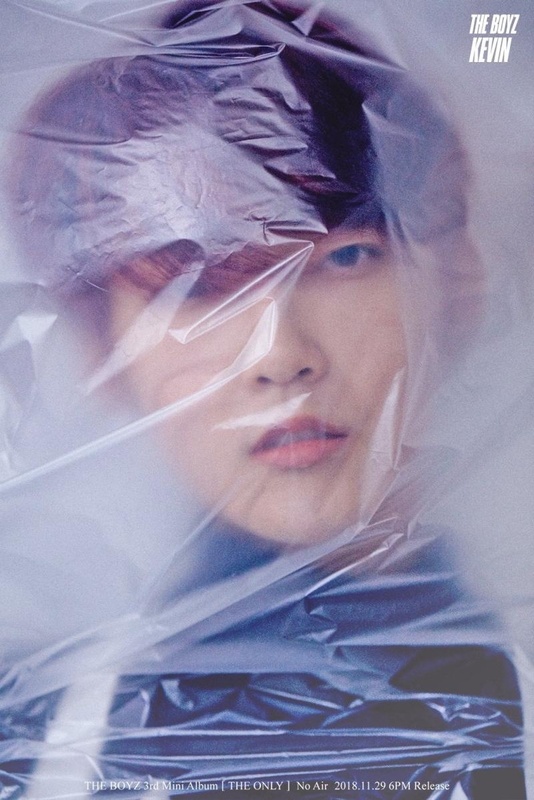 Sunwoo is a sophomore at Hanlim Art High School. 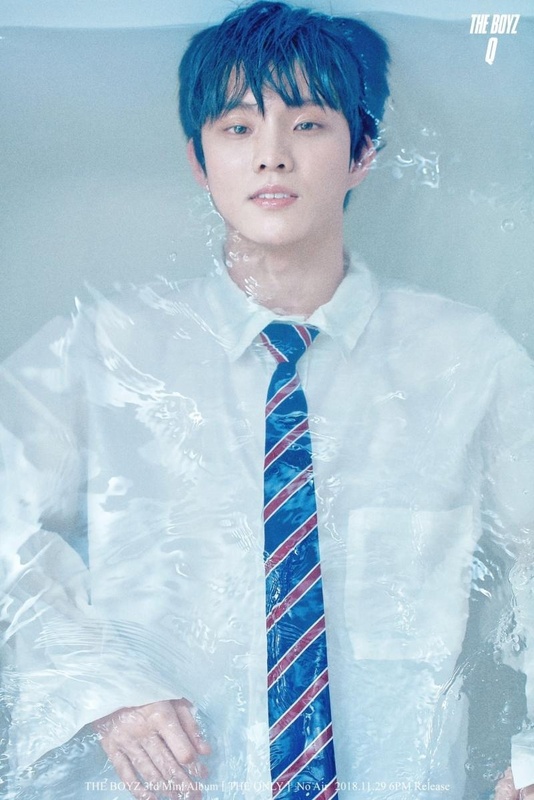 Hwall is a sophomore at Hanlim Art High School. His hobbies are Horseback riding, Acrobatic, Modern Dance. Kevin went to Burnaby Mountain Secondary School. New has a cross tattoo on his pinky finger on the left hand! I just watched melody days color mv again and I think Eric is in it too he’s the one with dog I think. it’s not that big of a deal but kevin was not in melody day’s colour mv, it was hwall. people just get them mixed up haha. 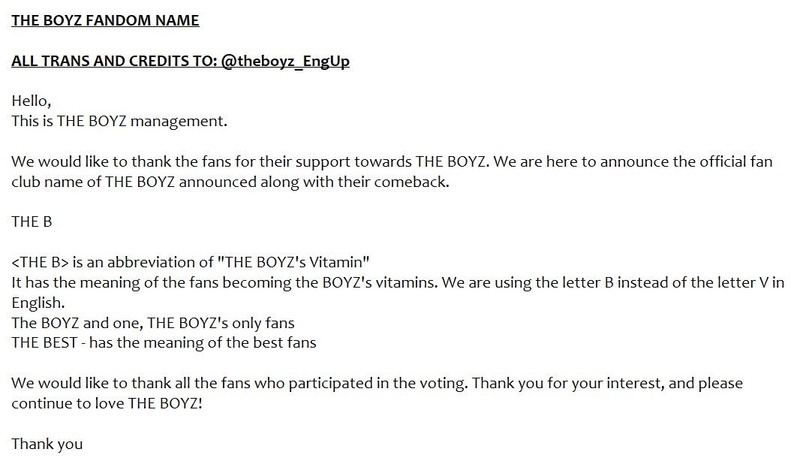 It would be nice if their fandom would be called Broz. 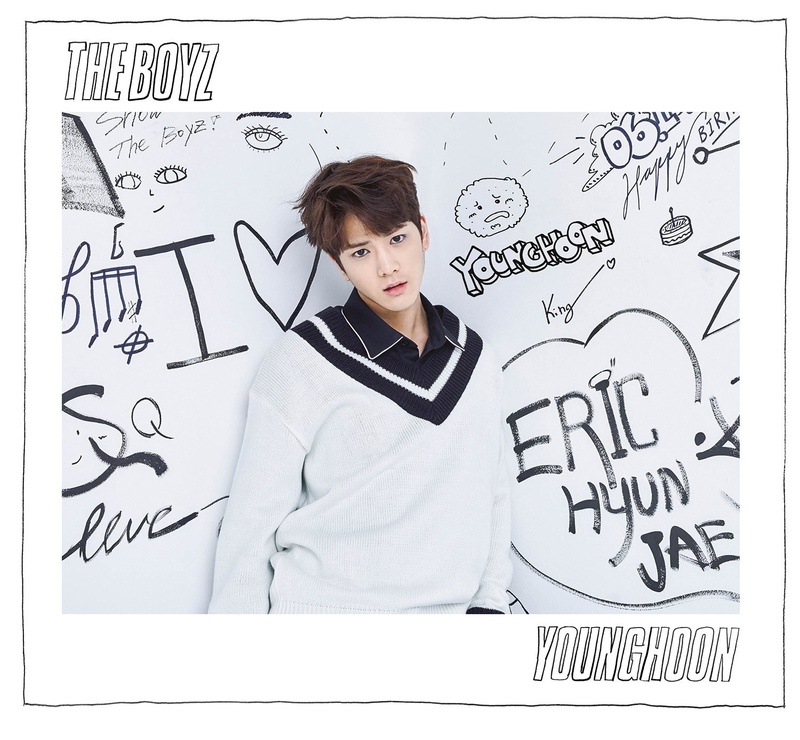 younghoon oppa…his voice is really hot omg! and before i knew it there is a certain person in their special clip im your boy thats looks like jungkook. 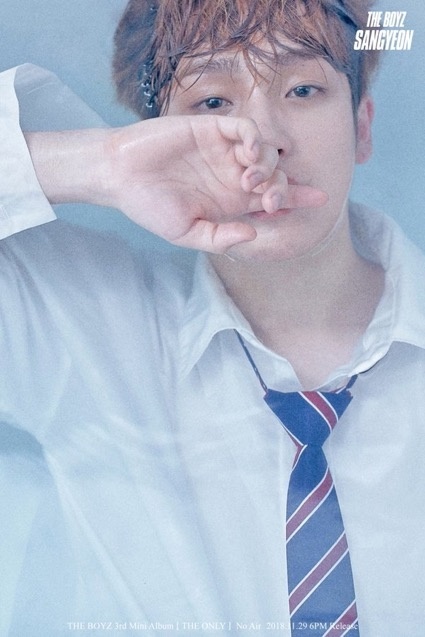 but i really like younghoon his eyes in omg. i dont know now. Younghoon’s role model is BTS’ V. He respects him a lot. Kevin, Eric and Jacob are all fluent in english. i think eric will be my new bias😍 what is their fandom name? 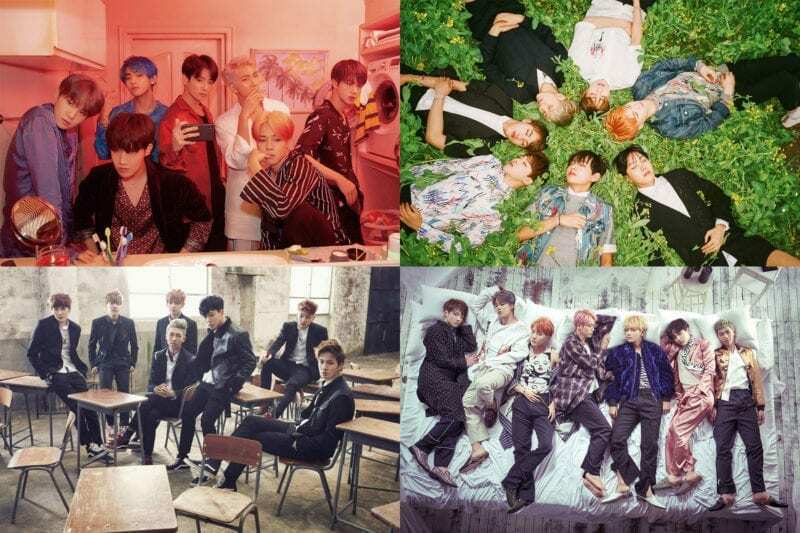 I don’t think they have assigned positions based on the line distribution in their title songs and also other songs on the album. 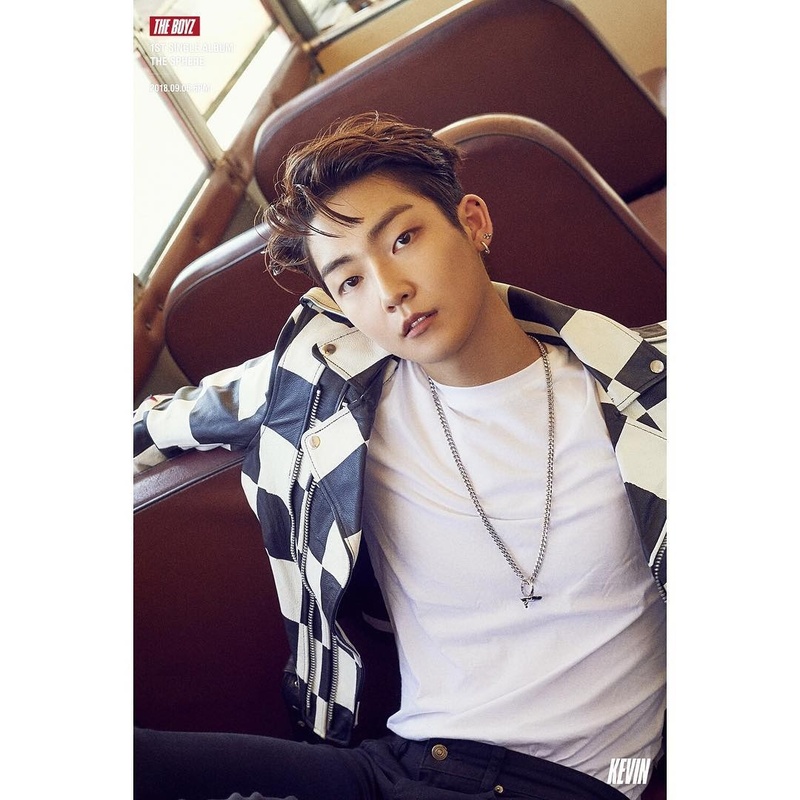 Kevin is definitely one of the main vocals (he’s for sure the best vocalist technically but his voice didn’t really suit the title songs so he didn’t get many lines). Also I’m not sure if Sangyeon is the leader or if they don’t have one at all. Wasn’t he said to be a temporary leader? It might’ve changed though since I didn’t see their last V Live. Both Q and Hwall are (main) dancers but also vocalists and rappers. 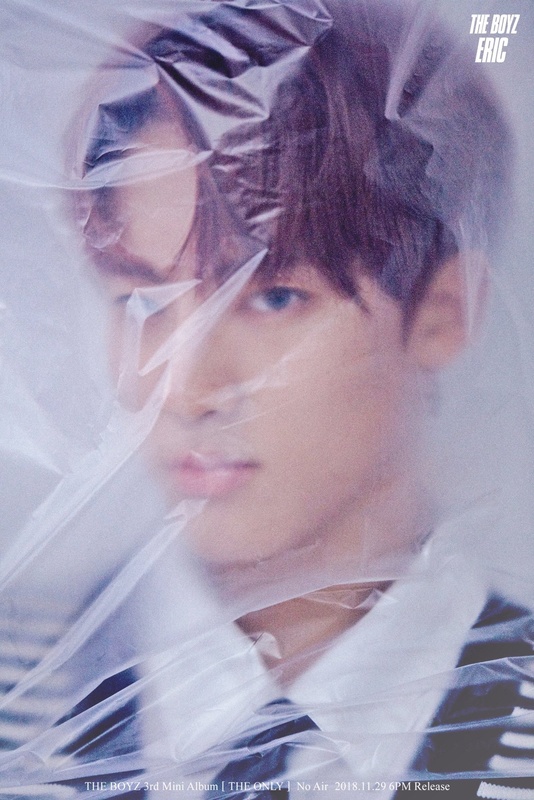 Also The Boyz focus on three visuals: Hyunjae, Juyeon and Younghoon so I’m not sure if Kevin was assigned the visual position. 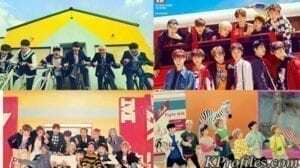 Based on the MV and showcase, I personally don’t think so. 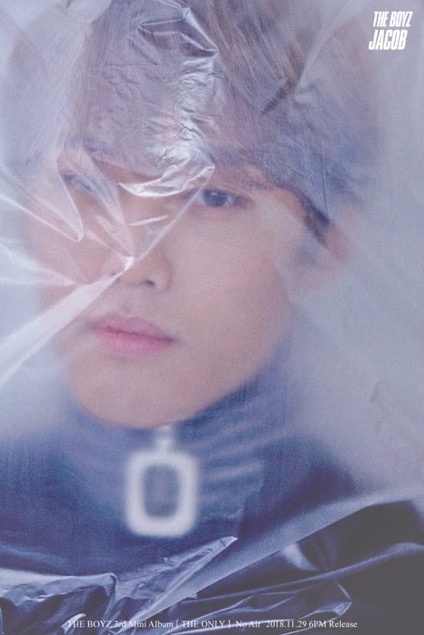 Eric is a (lead) dancer but also a vocalist and rapper. So yeah, that’s my input. We can’t really be certain until they release official positions (unless they don’t, like in Pristin’s case). 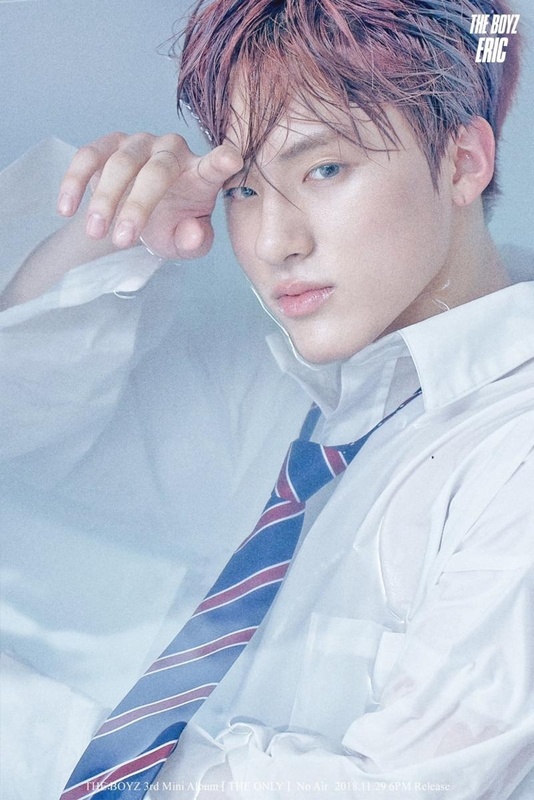 Kevin only went to College for four days before dropping out to join The Boyz. He was studying fine arts and psychology! Seems like Hwall’s role model is BTS’ Jimin! Apparently he went to the same dance academy (Just Dance) because he wanted to be an idol like Jimin. Juyeon and Younghoon modeled for Seoul Fashion Week 2017. 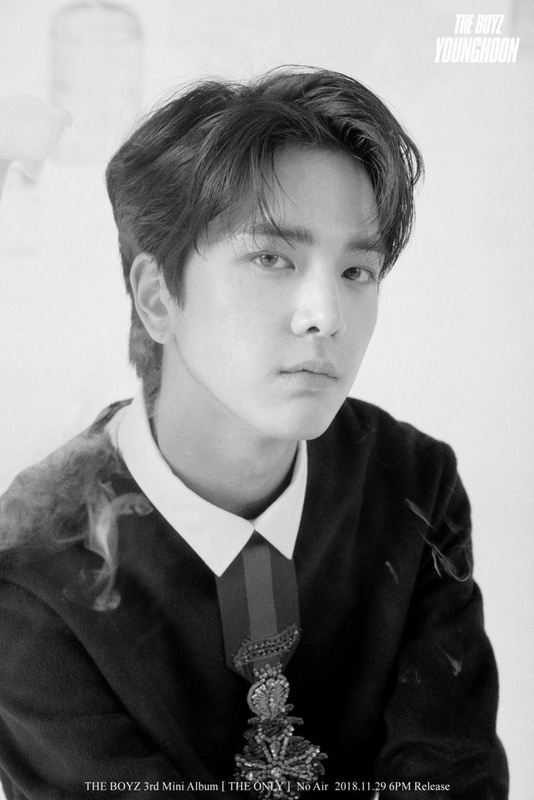 Younghoon modeled for “Paul Miranda Italy Pictorial”. 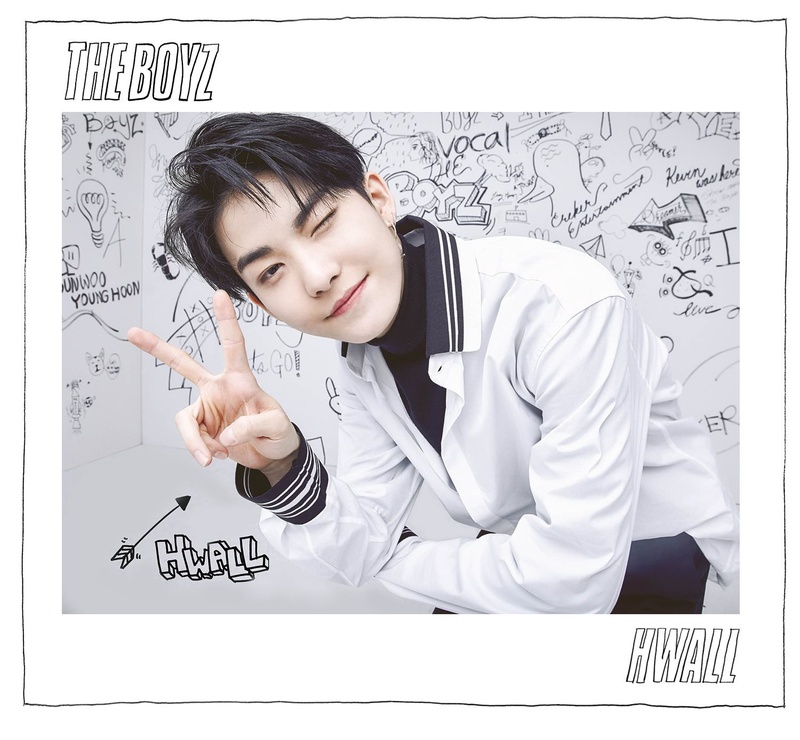 Hwall’s name means bow in Korean. His signature aegyo is shooting an arrow into fan’s hearts. Sangyeon has an older sister. Sangyeon likes to make fried rice balls. Jacob’s favorite colours are olive and burgundy. 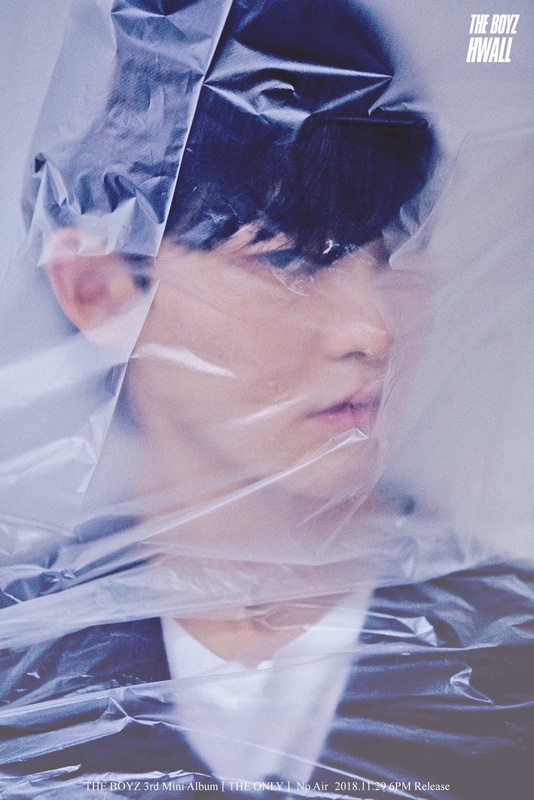 Jacob wrote, sang and composed the song in his DAZED profile video. Younghoon’s favorite colour is sky blue. Younghoon has an older brother. When Younghoon cooks, he guess the measurements instead of the precise measurements. 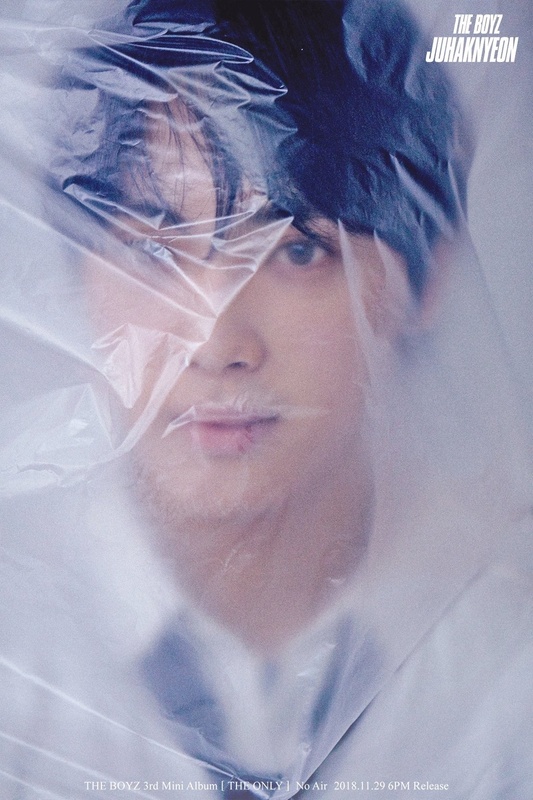 In 2017, Younghoon was a C.A.S.H Cube Model. Hyunjae has an older sister. Hyunjae prefers sports like tennis, ping pong, etc. Juyeon’s favorite colour is light green. Juyeon likes basketball and was in the Gyeonggi Youth Basketball Tournament. Juyeon stammers and sweats a lot. Kevin’s favorite colour is Olive. Kevin wrote the lyrics for Younghoon’s DAZED profile video. 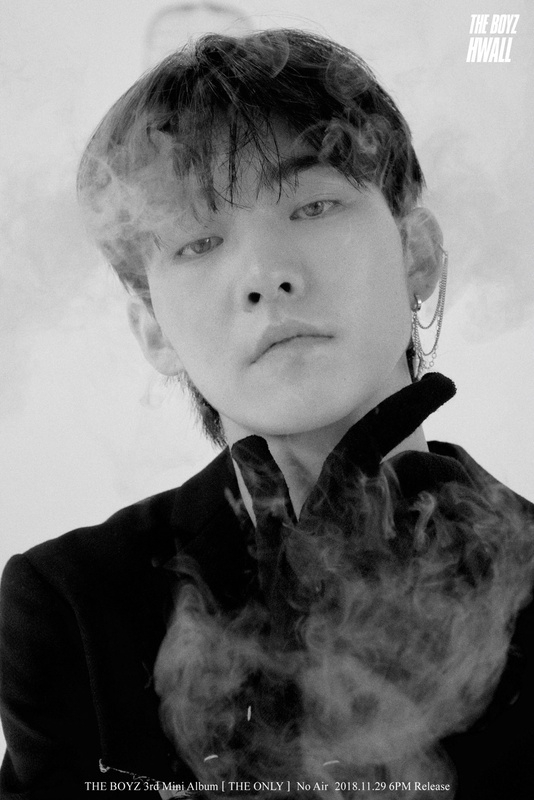 Kevin composed the song he played on the piano in his DAZED profile video. New has an older brother. New’s favorite colors are blue, black, white and brown. New has a tattoo of a cross on his left pinky. Q has two older sisters. 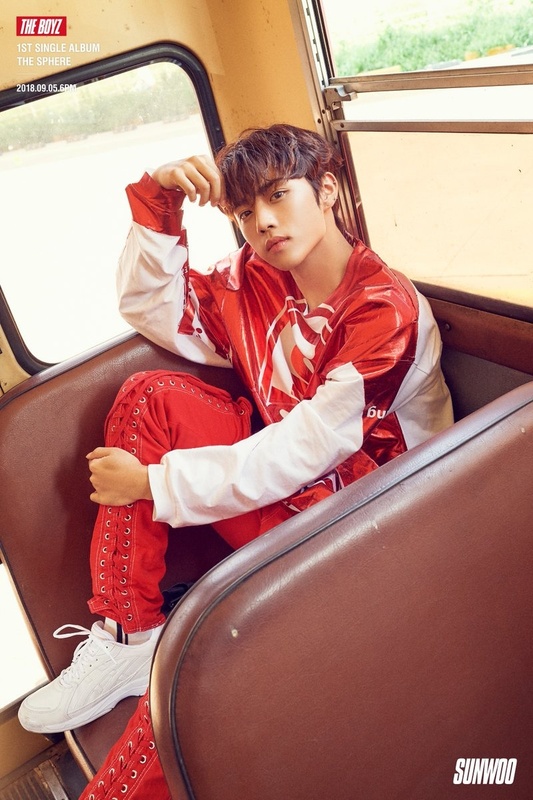 Q says his charm points are his dimples and his reversal from cuteness to powerful dancing. Q’s favorite colour is blue and sky blue. Haknyeon’s favorite colour is white. Haknyeon loves to ear. When cooking, he has to try everythiing. 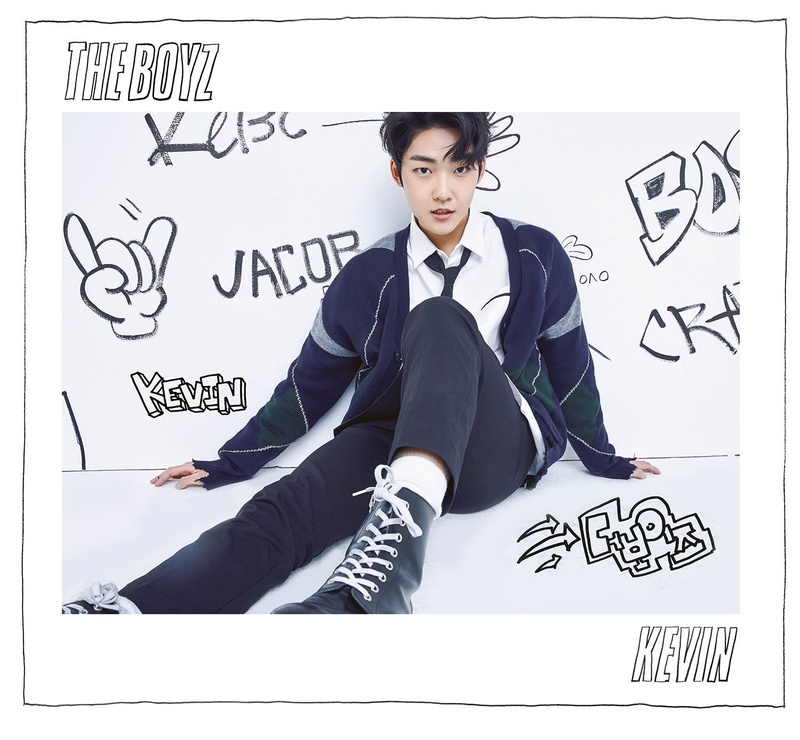 Hwall calls himself The Boyz’s ultimate weapon. Hwall is incharge of fashion. 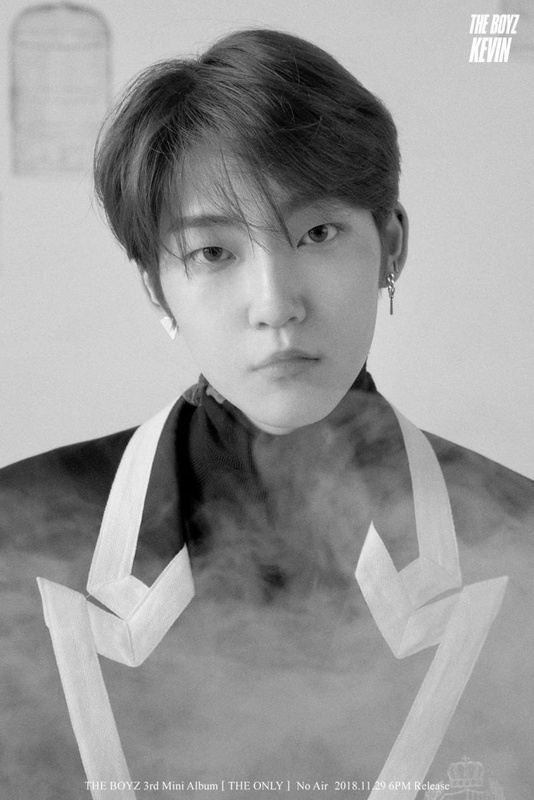 Hwall’s favortie colours are black and white. Sunwoo is very mature for his age. Even though Sunwoo is in the maknae line, the way he talks and acts is like an older person, like an uncle. Does anyone knows who the mood maker is? You’re welcome 😀 I love these boys. His special talents include doing impressions of actors from old dramas and movies. Jacob was on the basketball team for 4 years and volleyball team for 6 years. He got an MVP award for volleyball and was an honor student from elementary until Grade 11. His special talents include beatboxing and playing the guitar at the same time and doing the earthworm move. 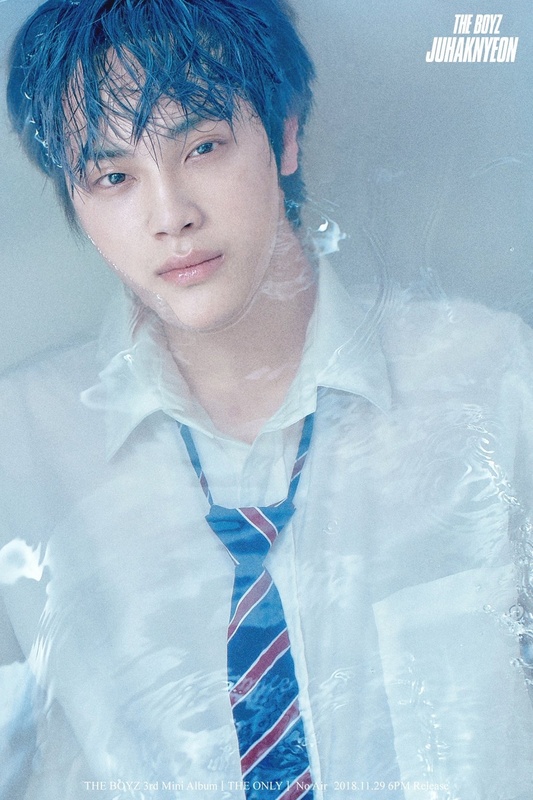 Younghoon won second place in a swimming competition in Incheon in middle school. He can imitate motorcycle and window-wiping sounds. Hyunjae had a high ranking at a kindergarten speech contest. His special talents include spinning a book (he can spin anything according to Eric) and making a recorder sound by using his hands. Juyeon was part of the student committee president in elementary school and received the National Assemblyman’s Commendation. New is level 1 in both abacus and mental calculation. 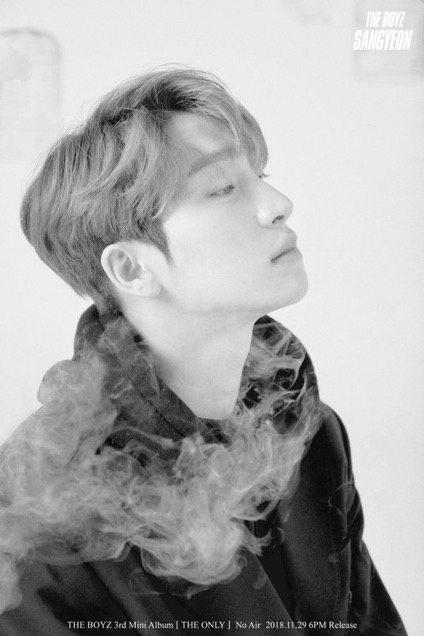 Special talent is looking like Zzanggu(a cartoon character) in side view, but members debated saying he looks more like Dooly(also a cartoon character). Q won a special prize in a piano competition in elementary school. His special talents are giraffe and pigeon impersonations. His special talent is b-boying(self-taught) and making the food he eats look delicious. 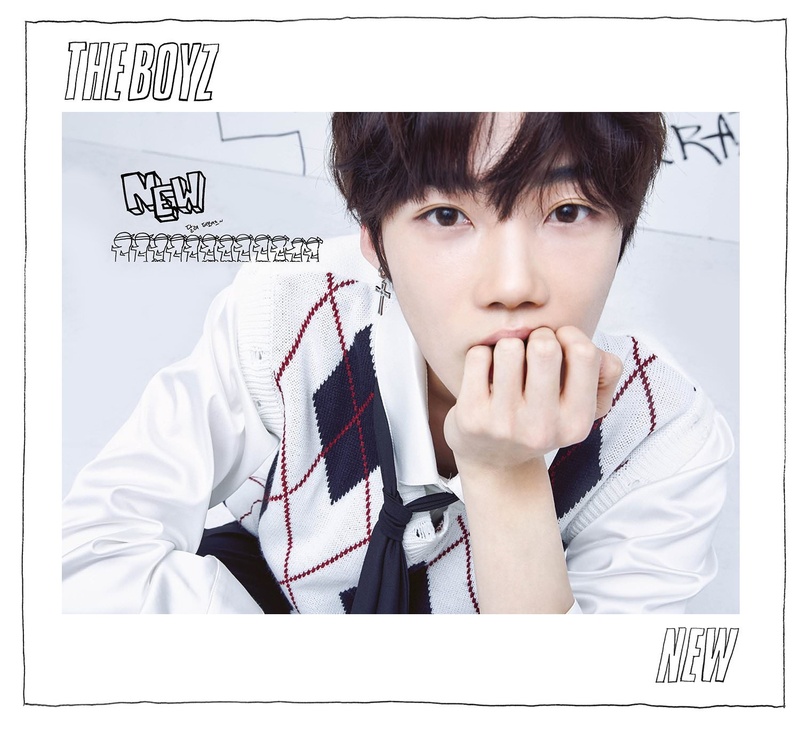 According to Hwall, he is the hidden card of THE BOYZ. He also won prizes from dance competitions. His special talents are modern dance and acrobatics. Eric won 4th place in a rubik’s cube competition (in Grade 4) and 2nd place at a baseball championship in California(in middle school). 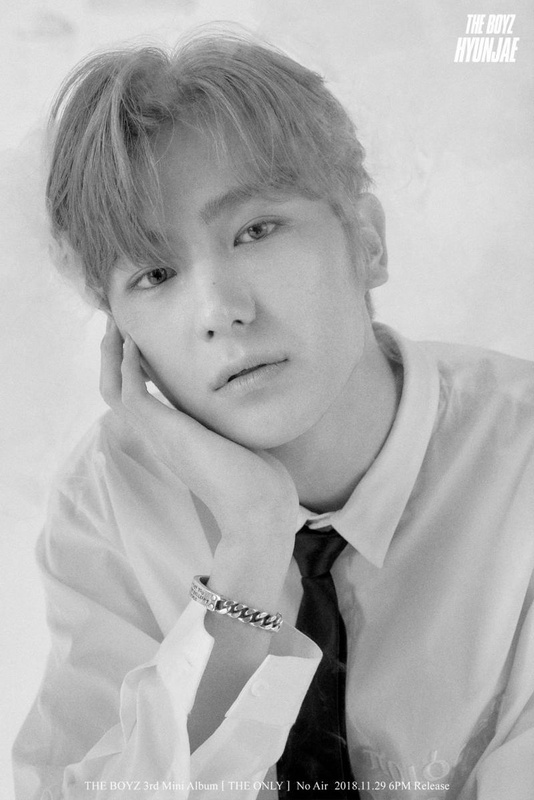 His special talents include solving the rubik’s cube in less than a minute, throwing the baseball far and fast, and eating instant noodles quickly. He can also do an impression of Geodude (a pokemon). Q. What is the adjective I want to add in front of my name? Q. How old were you when you knew Santa didn’t exist? Q. What is the Christmas present that you remember the most? Q. Any carol you want to sing to the fans, or any movie you want to recommend? Q. What’s the best way to end the upcoming 2018? A. 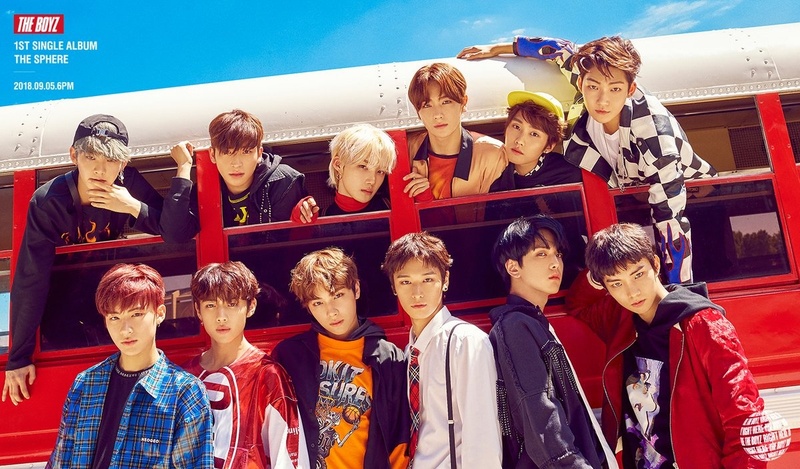 THE BOYZ are further developed! 2018 new artist award! THE BOYZ living busily! Happily and healthily!! 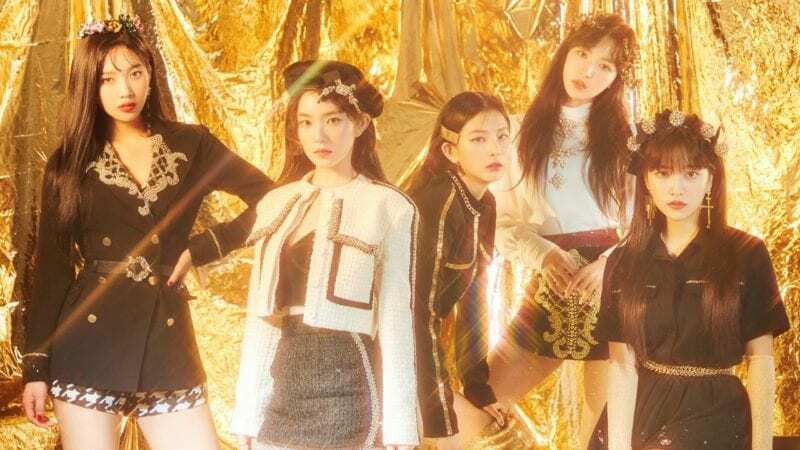 A. it’ll be good if we can receive the rookie award! A. A lot of work! A. I still believe in Santa! A. ‘Breaking Dawn’ with amazingly beautiful scenery! A. No! Santa does exist! A. I noticed it quite early on, but my parents played Santa so cutely and I liked getting presents in the night so I ‘believed’ until I was 12! A. I recommand the other Kevin’s ‘Home Alone’! Also, Ariana Grande’s ‘Snow In California’ for the song! A. I was 7 years old! A. Though we’re still new, hopefully to spend it productively and busily! A. During kindergarten, I was given ‘blue eyes white dragon’ (yu-gi-oh) toy. I was very very happy! Here are some of the boys height and weight! hwall’s height isn’t accurate, he lied on his resume haha. a fan (@joo_hard309 on twitter) asked him what his current height was and he said that it was about 178-180cm but he thinks it’s 180cm. So, Hwall height is rather 180 cm than what he wrote in the resume (186 cm)? this is true!! i think most of the boyz members lied/joked around about their heights & weights on the xsports interviews. 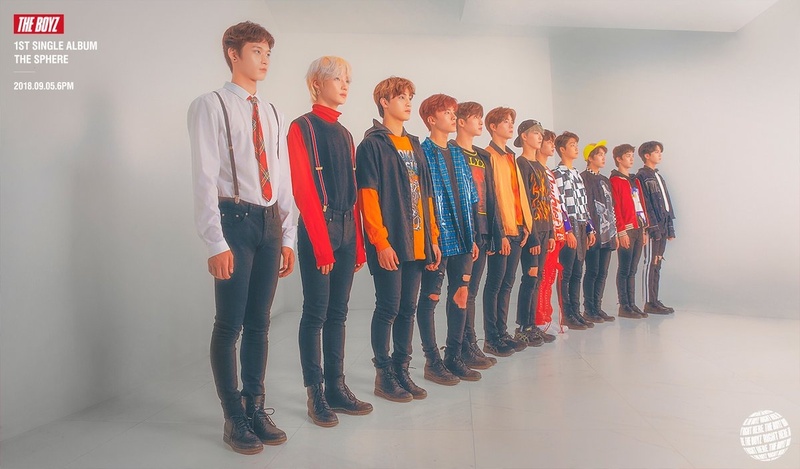 for the most part they were just being ridiculous & if you look at them lined up next to one another, juyeon is clearly the tallest, so……. 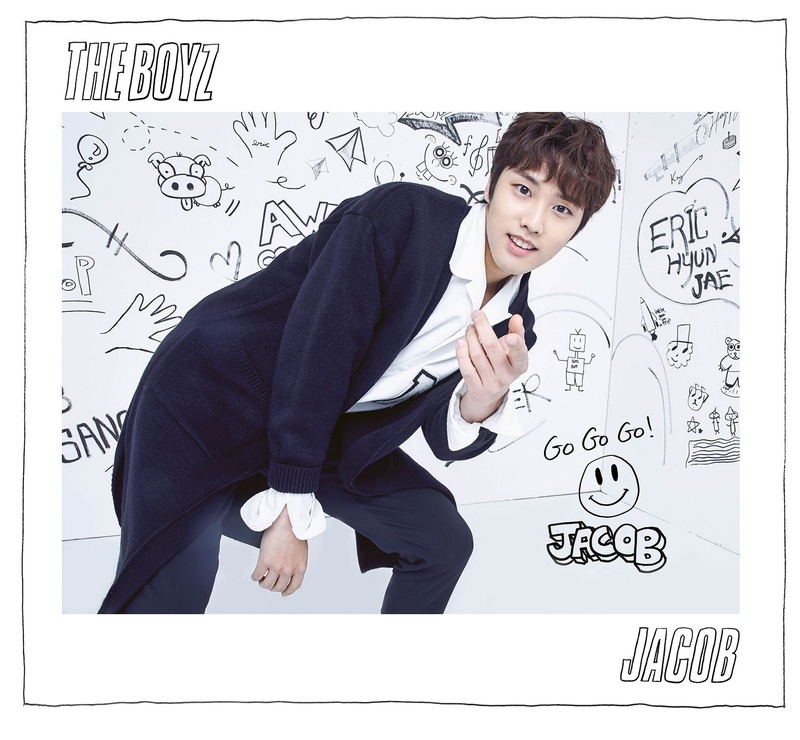 – Jacob is the best among the boys at Basketball, volleyball, drums, guitar, eating cereal (lol) and beatboxing. – Hwall is the best at facial expressions. – Eric is the best at basketball and being cute. – Kevin is the best at playing the piano and drawing. – Q is the best at powerful dancing. – Sunwoo is the best at rapping. – Hyunjae is the best at gags. – Juyeon has the best aura/atmosphere among the boys. – Younghoon has the best physique and face. 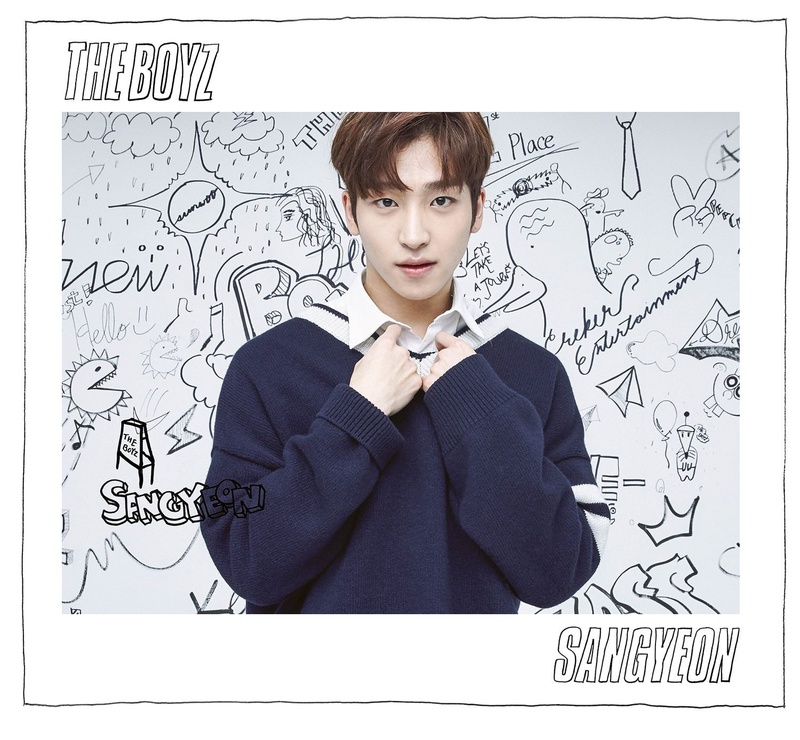 – Sangyeon is the best at individual talents. – Haknyeon is the best an badminton and running. Sunwoo: On his audition day, he overslept. And he was in a rush so he didn’t have time to be nervous so when it was his turn, he said he did better since he wasn’t nervous. And the audition was through his academy. Haknyeon: Since he was born and raised in Jejudo, he went up to Seoul to take an entrance exam for Anyang Arts High School for the theater and film department. And he got casted after he came out from taking the exam. Johnny asked him how he felt at the time and he replied saying he thought he was getting kidnapped so he was scared. Q: He did an audition at his dance academy and got casted. 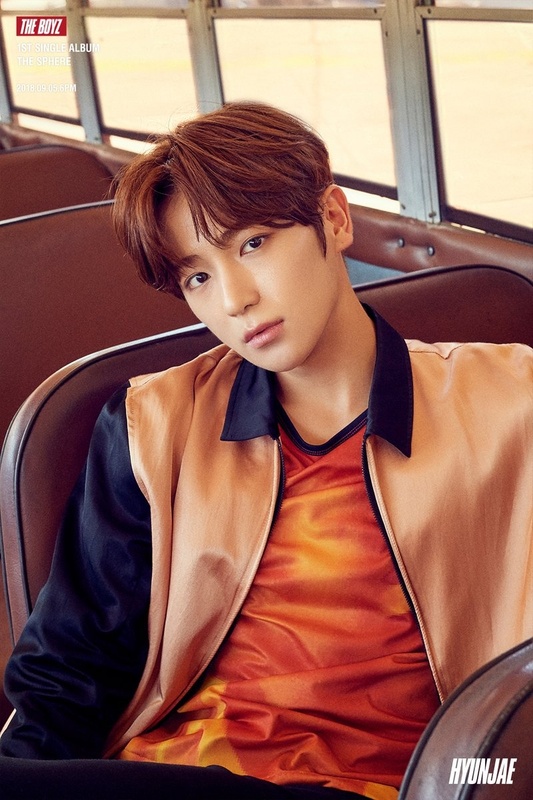 Juyeon: He went on a trip with his family and he was watching a performance one night and a casting director came up to him and gave him a business card. And he said, “Let’s try it.” (Auditioning) and got casted. Hwall: On the preliminary calling for Busan Arts High School, he got casted in front of the school and that’s how he ended up as a trainee. hello! here are the updated heights/weights of the boyz from a recent interview. ✧ Haknyeon said it took him the longest time to get closer to Kevin (because he joined late). ✧ Haknyeon hates horror movies. 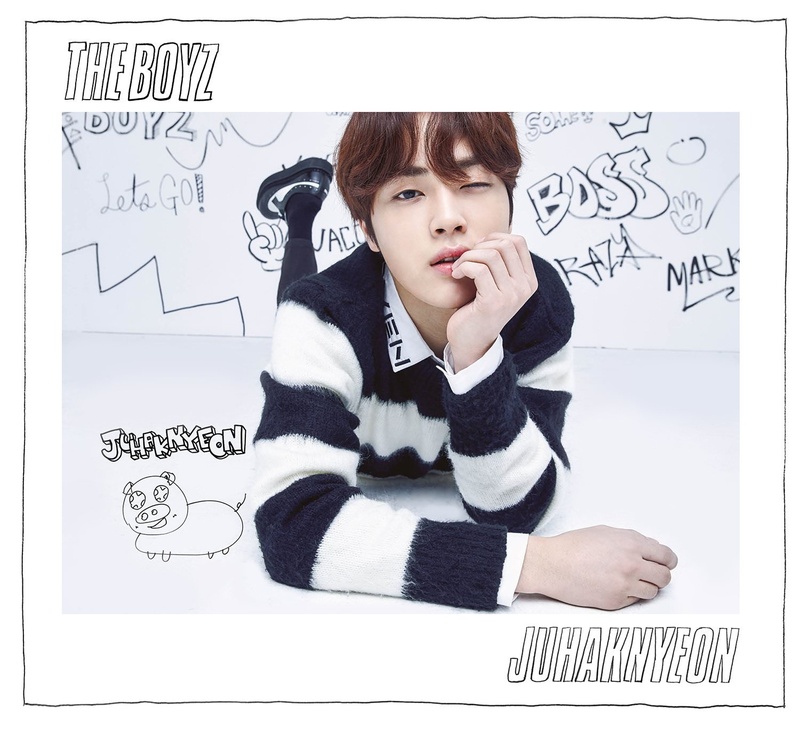 ✧ Haknyeon loves macarons and his favourite flavour is matcha. ✧ Haknyeon always has his pockets out when they’re performing because otherwise they brush against his legs and bother him. ✧ Haknyeon wears a Totoro onesie to sleep. ✧ Haknyeon’s favourite Baskin-Robbins flavour is ‘Strawberry that fell in love’. ✧ Haknyeon raised all kinds of animals: chickens, pigs, dogs, hamsters and tortoises. ✧ Q loves horror movies. ✧ Hyunjae said he would like to collaborate with EXO’s Baekhyun. ✧ Hyunjae’s favourite Baskin-Robbins flavour is ‘My mom is an alien’ (dark and white chocolate). 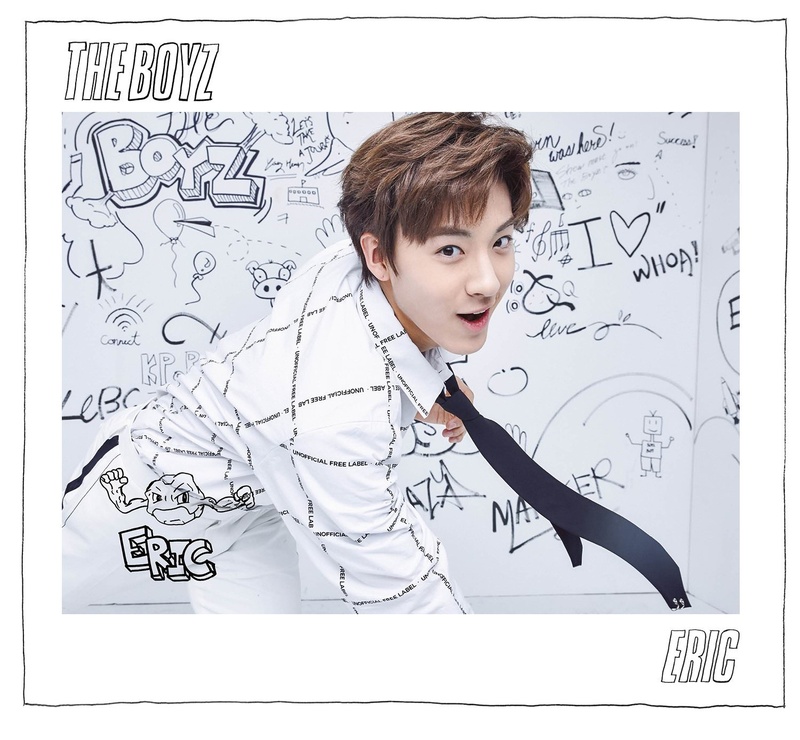 ✧ Eric is friends with TRCNG’s Hohyeon and Jihun. ✧ Sunwoo loves the anime ‘Kimi no na wa’. 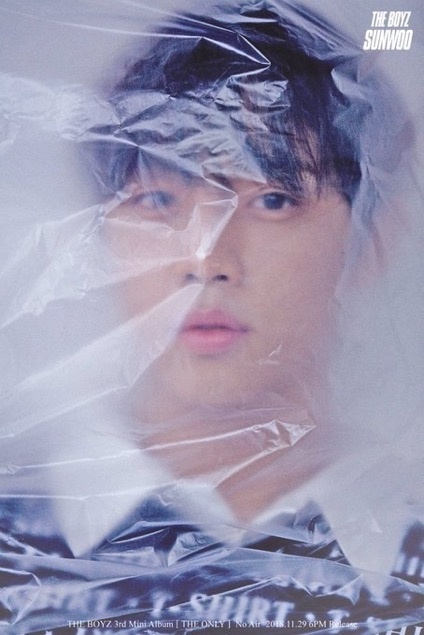 ✧ Sunwoo wants to release a mixtape if the company allows it. Kevin is not 175 cm, but 176 cm. 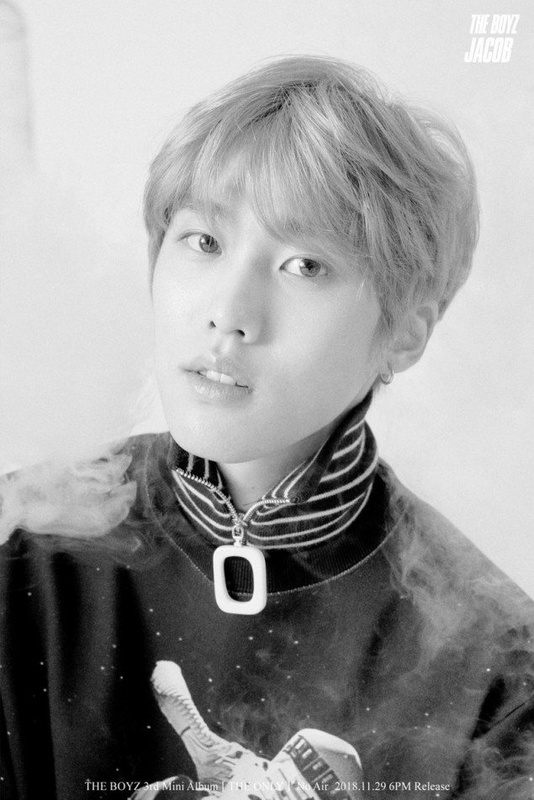 On CECI Magazine January 2018 Issue, Kevin said he’s 176 cm. Q : Instead of Cartoon Boyz, is there any term to describe your team (Kevin, Hyunjae, Juyeon, Younghoon)? Younghoon : Tall Boyz. Four of us are all tall. There are 3 members who are over 180 cm. Kevin : I will first to confess. My height is 176 cm. hi! just want to say that please take off the link to kevin’s youtube channel! kevin said it should delete but he and his friend forgot1 the password so please take off! 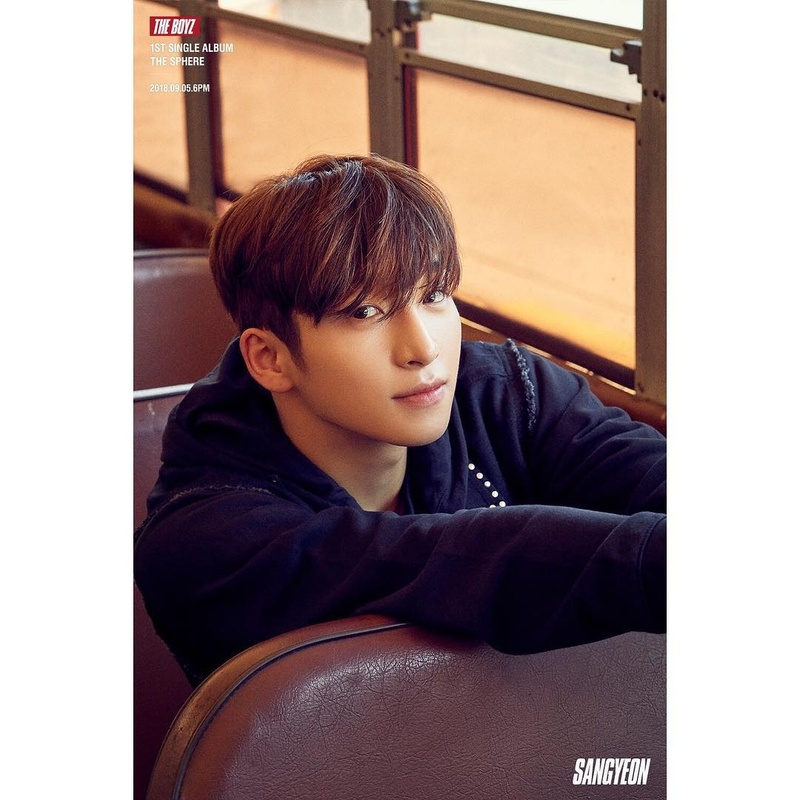 ✧ Sangyeon – Leader, (Main) Vocalist. It’s hard to determine his position but he can pull off high notes so he’s more of a main vocalist than a lead vocalist in my opinion. He might not get many adlibs but his skills are definitely really good. ✧ Jacob – Lead Vocalist. ✧ Younghoon – Lead Vocalist, Visual. ✧ Hyunjae – Lead Vocalist, Visual. ✧ Juyeon – Lead Dancer, Visual. 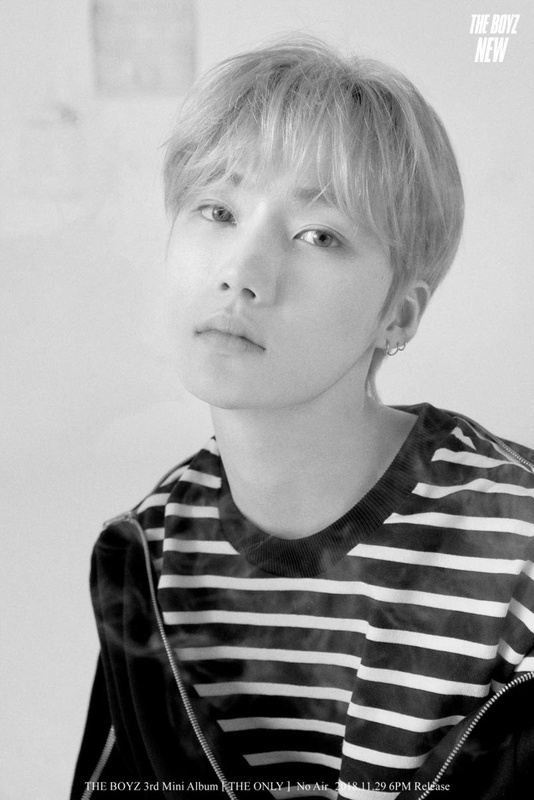 ✧ Kevin – Main Vocalist. ✧ New – Main Vocalist. ✧ Q – Main Dancer, Vocalist, (Center). He usually leads the choreography. ✧ Haknyeon – Lead Dancer, Face of the Group. ✧ Hwall – Main Dancer, Rapper, Vocalist. 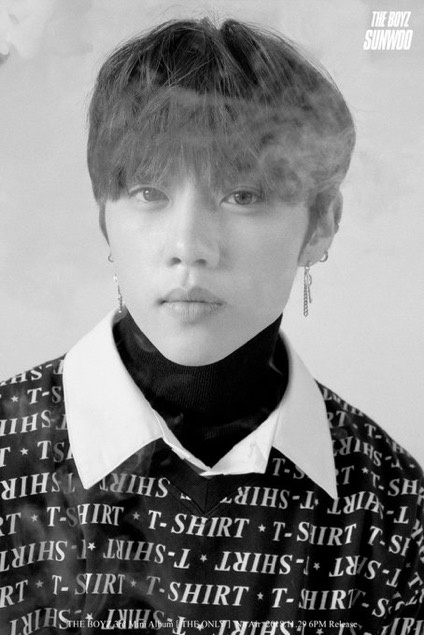 ✧ Sunwoo – Main Rapper, Vocalist. ✧ Eric – Lead Dancer, Vocalist, Rapper, Maknae. ✧ Juyeon likes Hello Kitty and has a lot of Hello Kitty merchandise at home. ✧ Juyeon said he rarely gets sick but when he does, it’s usually really serious and he has to go the hospital. ✧ Juyeon likes to drink milk. ✧ Juyeon said he stopped growing when he started having problems falling asleep. ✧ Juyeon is supposed to be wearing prescribed glasses. ✧ Younghoon says he likes spending time in cafes. ✧ Younghoon said he likes to eat chocolate muffins and cheesecake. 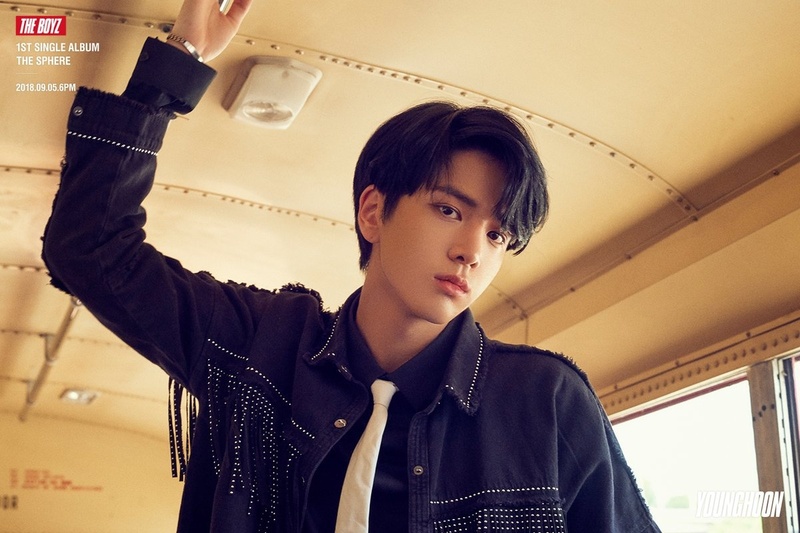 ✧ Younghoon wants The Boyz to win the ‘Rookie of the Year’ award. ✧ Kevin likes to listen to R&B. ✧ Jacob said that if he had a younger sister, he wouldn’t introduce her to any of the members. ✧ The Boyz placed 2nd in the ISAC Aerobics Competition. According to Juyeon, when he’s lightly asleep, Hyunjae apparently “dances”. Hii I was just wondering, where did he say that? I’m not sayiing you’re lying I’d just like a source. 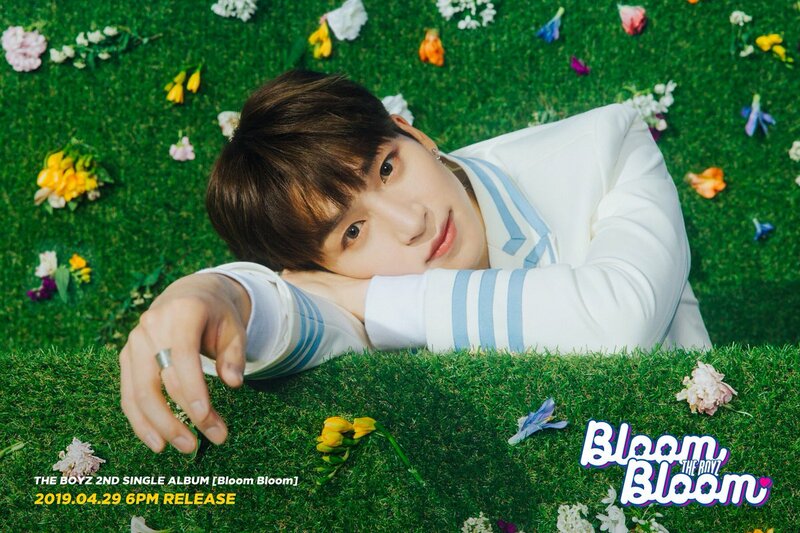 Sangyeon is friends with JBJ’s Longguo! Haknyeon graduated from Hanlim on February 9th! Haknyeon and UP10TION’s Xiao are classmates and both graduated in Hanlim Multi Arts High School on February 9, 2018. 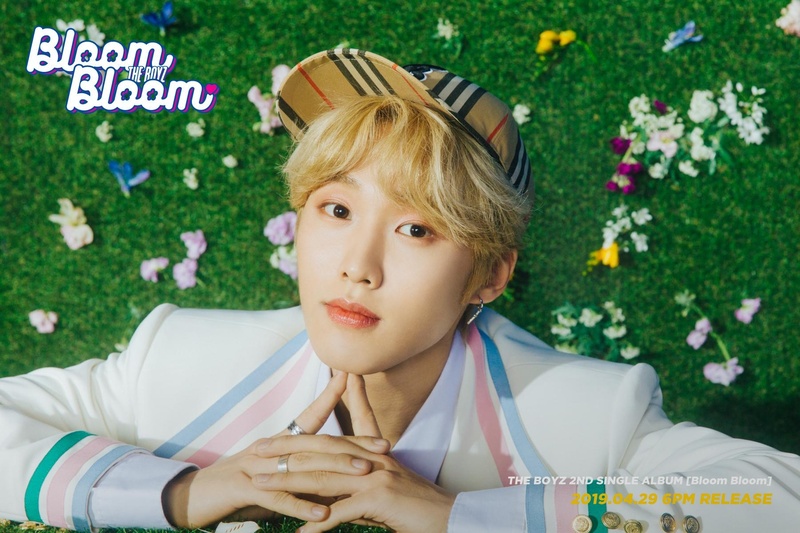 ✧ Before debuting with The Boyz, Kevin sings OST for SBS Drama ‘Saimdang, Light’s Diary’ with the title ‘Half’ which he was credited as Moon Hyung Seo. 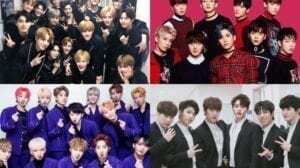 the boyz is a permanent group right? Q is left handed. information from recent vlive he did with younghoon. It might not be 100%, but in The 100, they say that “dance line” is Juyeon, Q, and Hyunjae. Wouldn’t this mean that Hyunjae is at least a “dancer” if not a lead one? Also in The 100, they call Juyeon and Q main dancers, which could have been an exaggeration, but I just wanted to mention those. i can’t find the webtoon!! 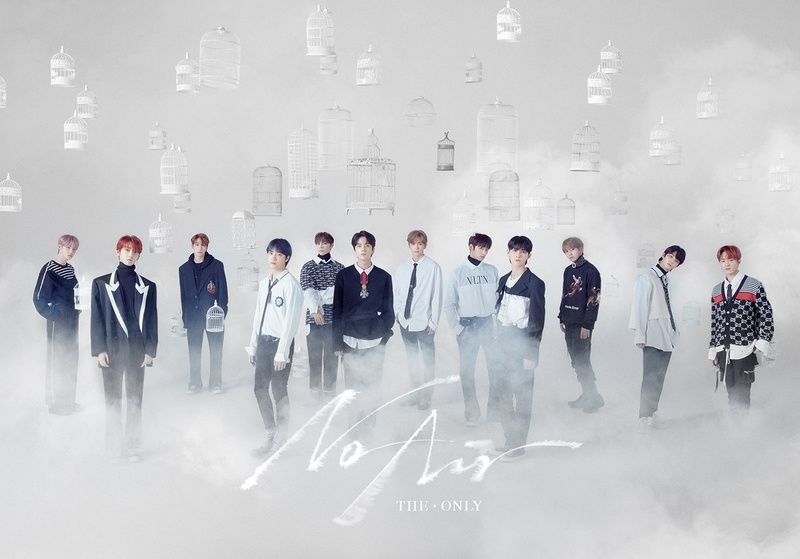 the teaser pictures for ”THE START” are out so maybe you can upload the pictures?? Do we have a fan name yet? Hyunjae is part of the official dance line, in THE100, he along with the main dancers (Q and Juyeon) were called the official dance line. You can watch it on youtube “Don’t let me down”, he was called one of the dancers of The Boyz. 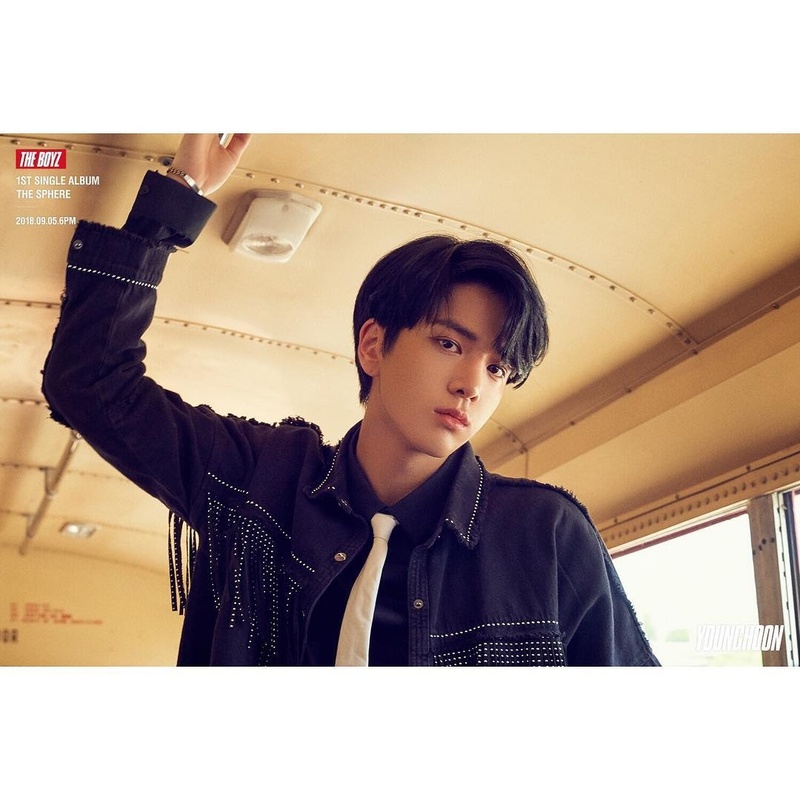 He, Q and Juyeon are possible centers due to their dance line title. Please upload their fandom name, pictures and latest comeback. Hwall does not speak English, only Kevin, Jacob and Eric are fluent in it and can speak it. he can speak english, he lived in the Philippines for four years. If you watch fan signing videos, Hwall speaks english to the foreign fans. He can speak English but I think he is just a shy boy. He barely talks even in Korean so I guess that’s the reason. But I think he can understand and can speak well. In ASC, they had their introduction and he was praised for good english. The hosts are also speaking in English and he was smiling all the time like he can understand it. 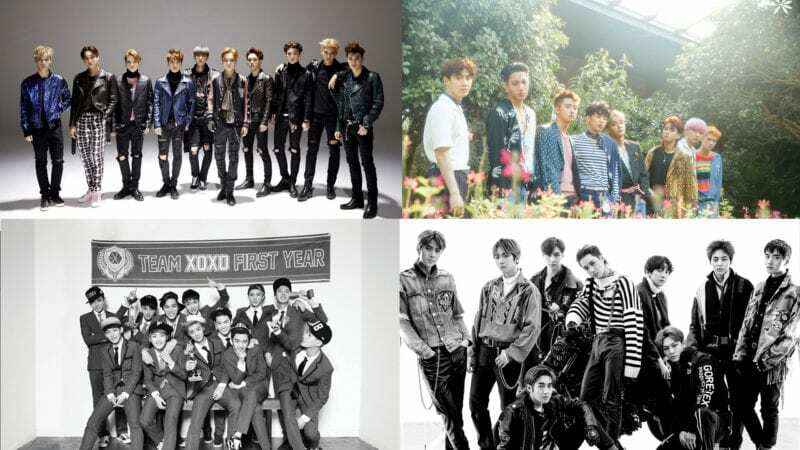 I still cant choose one of them as my bias they’re all talented, eottoke? 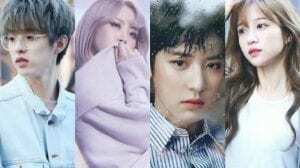 Sangyeon was in Ailee’s “If You” MV with Pristin’s Nayoung. How?? Is?? Every?? One?? Of?? 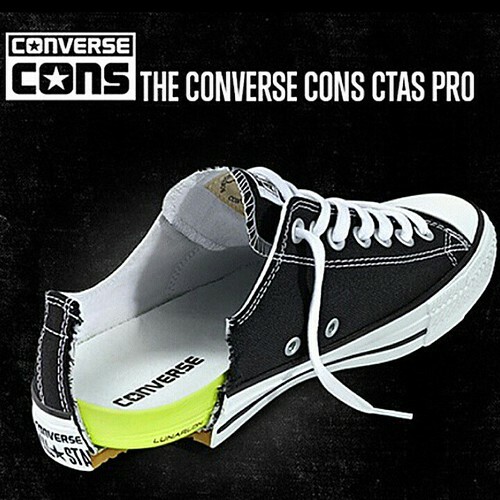 Them?? A?? Visual?? Q and Sunwoo also the vocalist..
*Q and Juyeon also the vocalist.. I would say, they speak basic English, most aren’t very fluent. They’ve got a basic concept of English. Jacob has an older brother that looks EXACTLY like him. Here are some videos of them. maybe they write it differently in order to look cutter when they refer him by his nickname? Q is exactly like BoA because they both have the same birthday, with the same chinese zodiac and blood type too. eric is good friends with daehwi! The name information for Ju Hakneon is wrong. The chinese character for Hak in his name is 鶴, which means crane (the type of bird). It is NOT 學 hak for study. I’ve seen this misinformation in several places, please update! – His older sisters name is Stella. 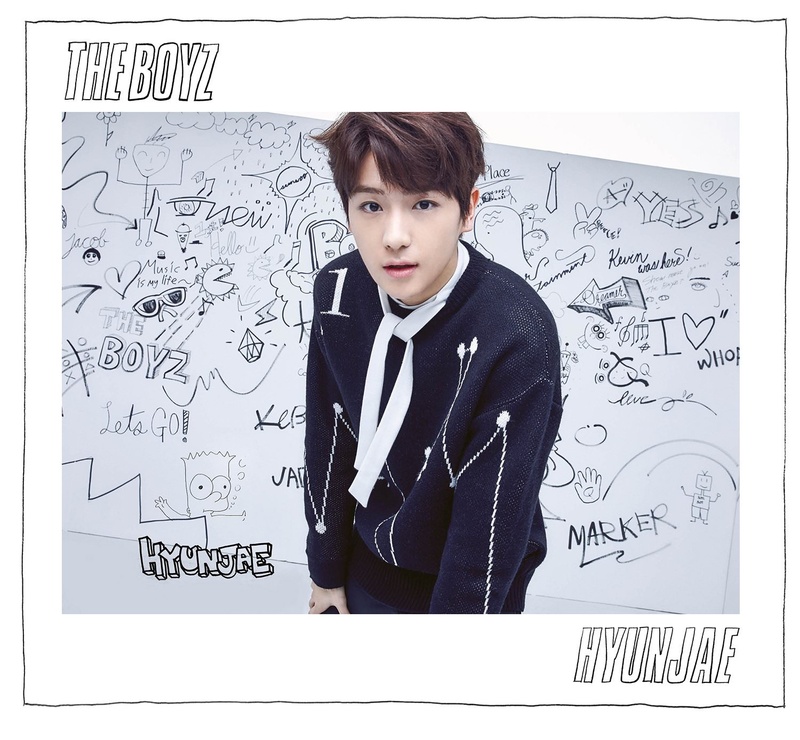 The boyz’s lead vocalists are Sangyeon, Hyunjae AND Jacob. You haven’t included Jacob as one of the group’s lead vocalists when it’s obvious he’s a lead vocalist. First of all because Sangyeon, Jacob, Hyunjae, Kevin and New were introduced in Flower Snack and Vlive as the vocal line, so while New and Kevin are the main vocalists, the rest are lead vocalists, including Jacob. And in Keeper, the difference between Jacob and New + Hyunjae is just 2 seconds. Even in their b-sides, the amount of lines Jacob gets is ALMOST always the same as the other vocal line’s members. With that being said, Jacob is the lead vocalist. I hope someday you change it. How can i tell them apart??? 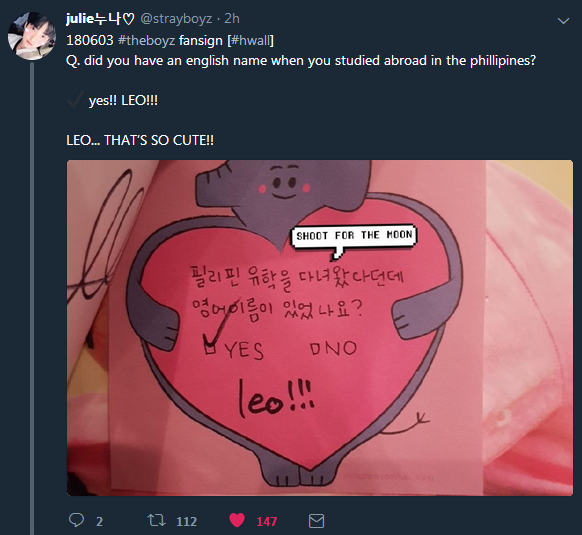 Hwall lived in the Philippines! Cool I’m Filipino myself. 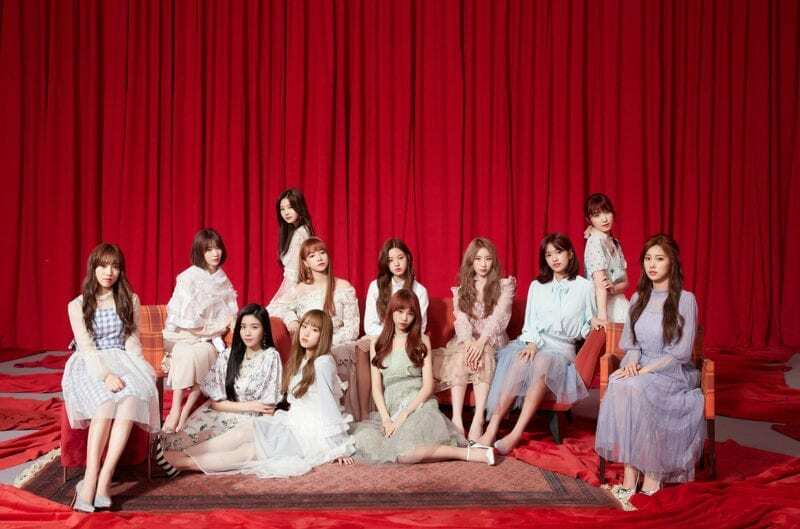 All of the teasers are out!! TOO MUCH VISUAL I’M BLIND!!! Source: (Come on! 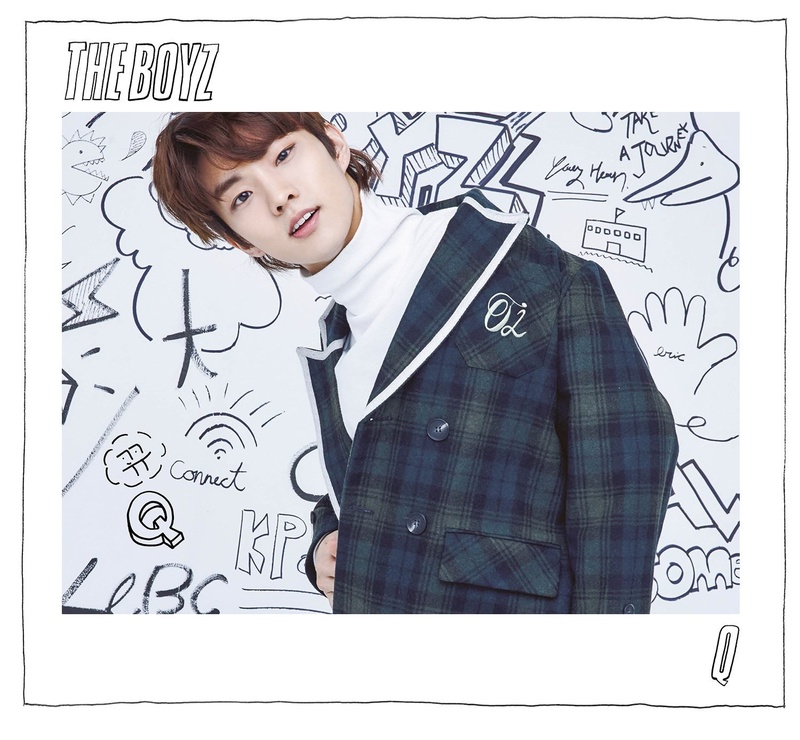 THE BOYZ): RPG (Summer Vacation RPG Edition) Ep 8. Sangyeon can speak basic english. He stayed in Philippine to study english for a month. 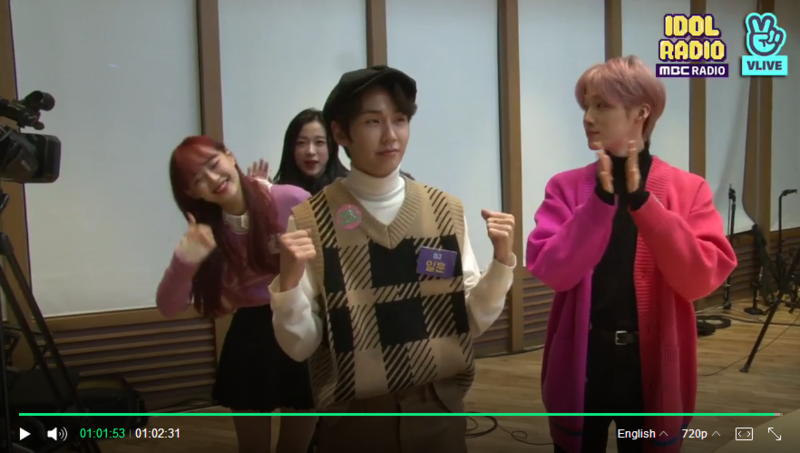 Sangyoun also appeared in Melody Day’s “You seem busy” along with Haknyeon, Juyeon and Hyunjae! Hwall has a younger sister (4 years younger than him). yes B!!!!!! im from vancouver too! nice to see my babies doing well!! like mark from nct!! Hwall’s was said at a fansign too! I finally remember, Younghoon sometimes looks a LITTLE bit like NCT Taeyong. I know a lot of people probably don’t see it but I do. 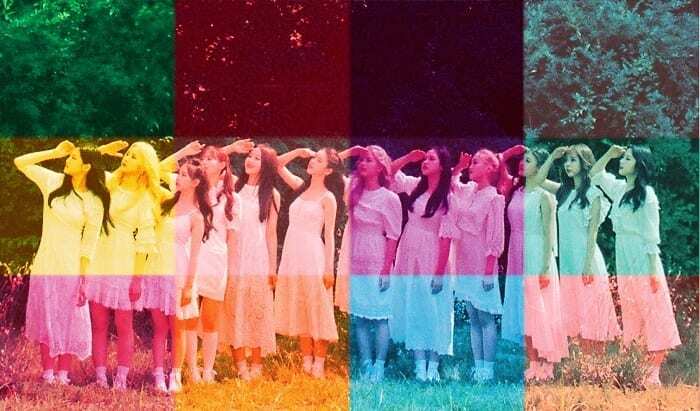 So I have a question….I have watched one of the new episodes of weekly idol and they have said that they have/are colours? I know it’s confusing but I think it’s kind of cool cause I’ve got a brand new zodiac sign that’s never been used before! It’s called Ophiuchus. Kevin also has an older brother. One of Jacob’s hobbies is playing the guitar. Juhaknyeon likes to drink mango juice, he trained for 2 years and one month and he is close to Sunwoo. Jacob’s brother is older than him. Juyeon has a little brother. New’s older brother is 10 years older than him. 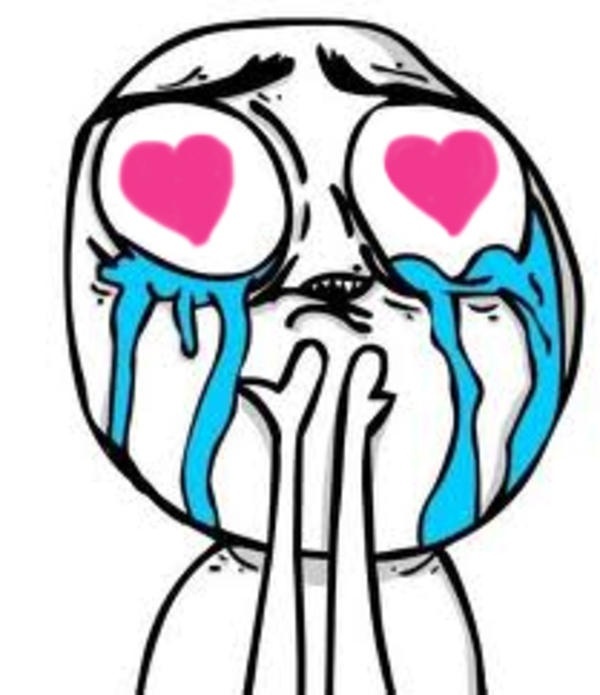 And also Sunwoo’s younger sister likes Juyeon. His younger sister is two years younger than him. NASA isn’t in control of the zodiac signs. Astrology has existed long before NASA was established. NASA discovered a constellation not a zodiac sign. The dates can’t change because the signs aren’t influenced by time, but by the placement of the sun in the sky. So it’s safe to say that their signs haven’t changed and will never be in a loong loong time! 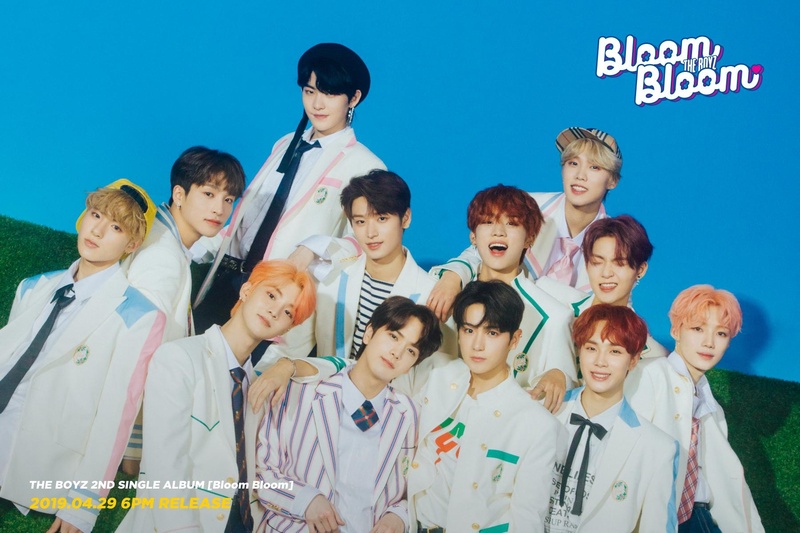 Does anyone know how many pet dogs The Boyz have in their dorm? wAiT why isn’t he one of the visuals?? 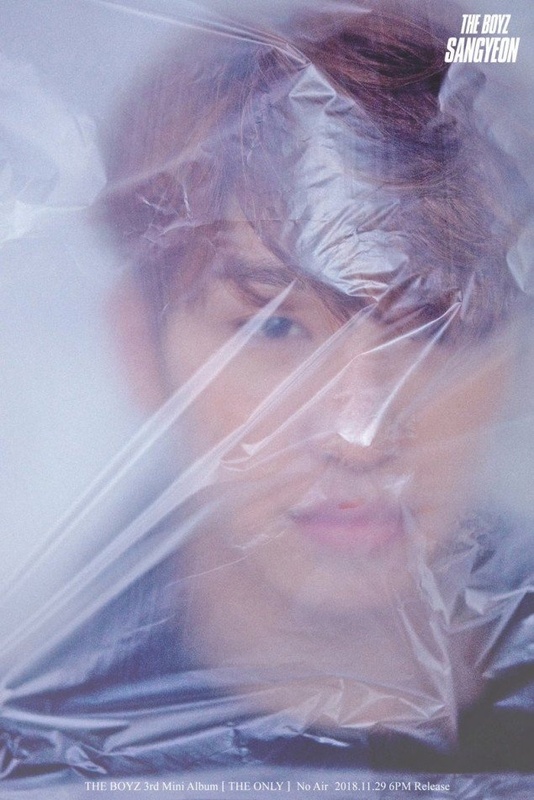 Eric is a huge fan of GOT7. Also hwall and seonho are friends. 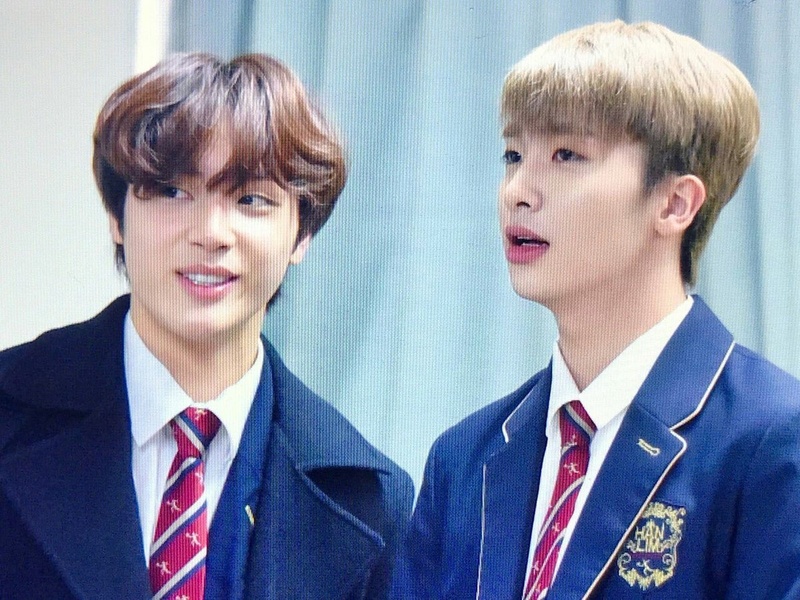 They both went to same school, hanlim. 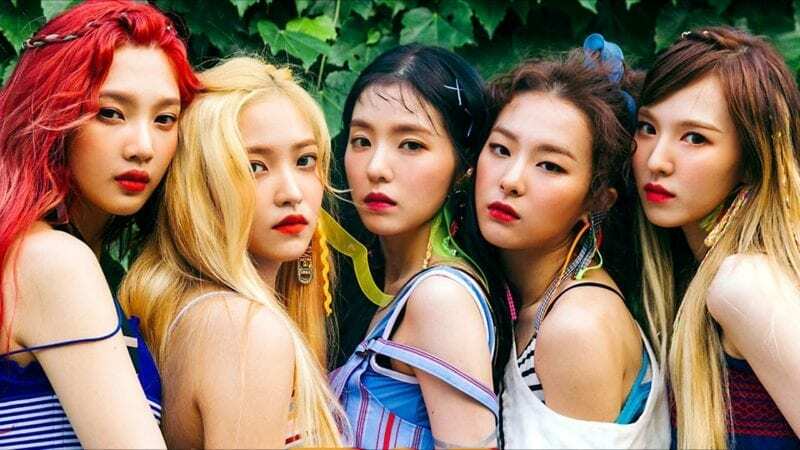 I really really like this group, they deserve to perform in big events were a lot of people watching because they are great performer, they were so talented . I hope that I could see you guys when I will go in korea!! 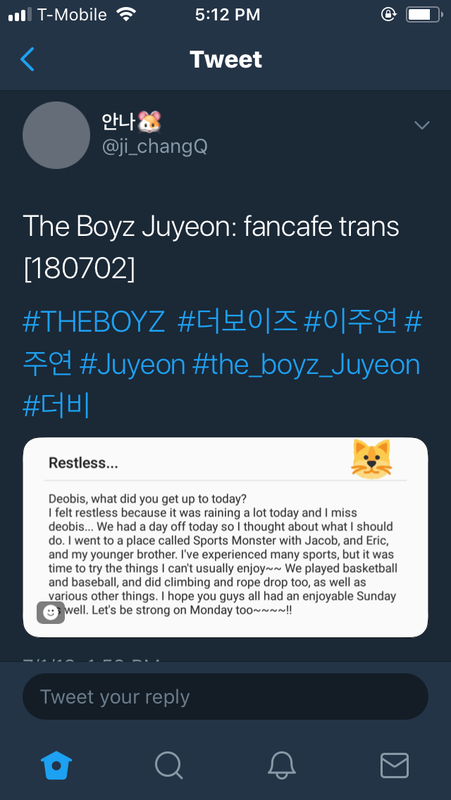 Isn’t Juyeon considered a sub-rapper now? Like, he covered Hyoyeon’s rap part from ‘The Boys’ at KCON in Thailand. 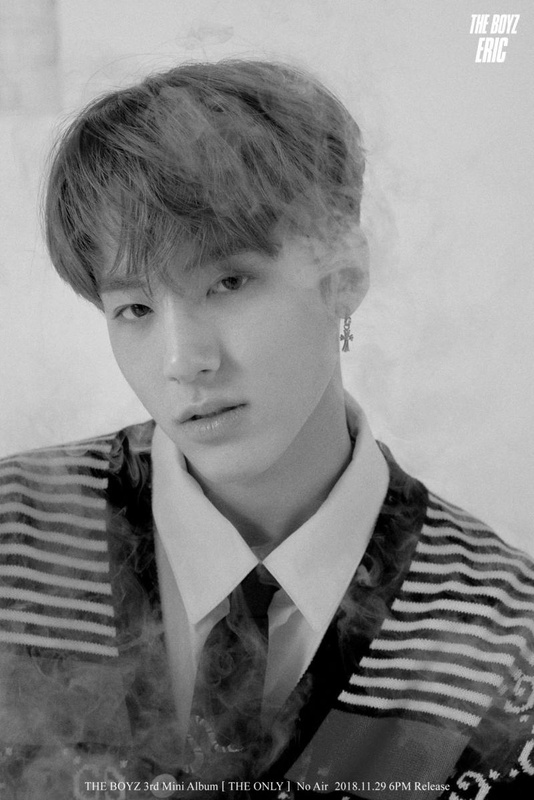 Is it just me, or does Younghoon look like a mixture of EXO’s Sehun and BTS’s Jin…? He’s such a visual, omg! Hey can you please change the images to one of those here? So Jacob is my bias. Kevin and Younghoon are my bias wreckers. Kevin is just UwU and then Younghoon is another UwU, and plus V from BTS is his role model who happens to be my bias in BTS. Same cause hes role model is tae so he’s my bias too and try to learn this new group now. Younghoon really he love and admire Taehyung so much. .Like he confess he’s deepest and appreciation to taehyung ..Like a gf.. He always mention him every time.. And AAA awards yesterday he really whipped for tae and of course he respect tae so much.. I hope someday he will meet tae maybe in the bathroom or in the games . Fighting..
Eric ain’t your fav colour pink? yes he look taller, but they often wear insoles, so we can’t know who has bigger insoles…. Q is known for his high-pitched “dolphin” screams. 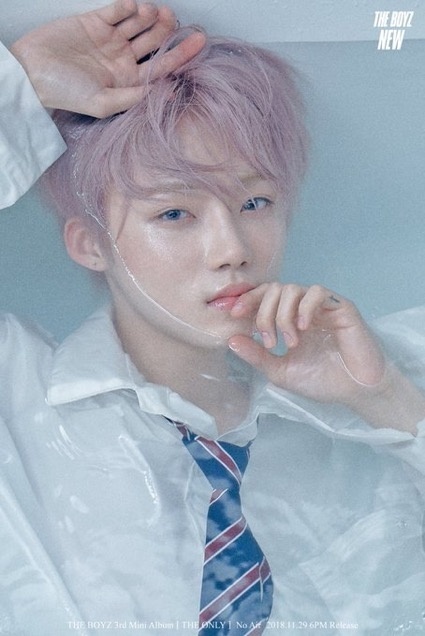 chanhee 🥰 the boyz rise ! New doesn’t know how to swim. Juyeon is scared of pigeons. Sunwoo has a habit of falling asleep. Sunwoo is always the one that gets scared easily. they look so good here, what do you mean? 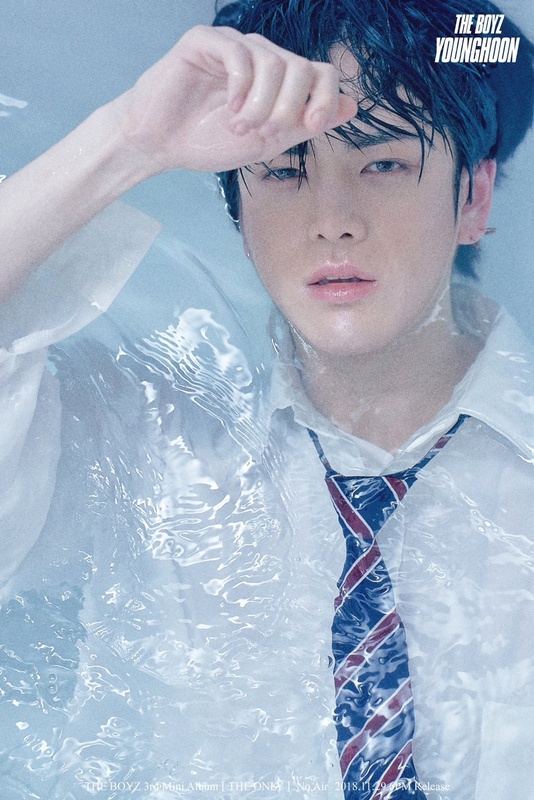 I just think their individual photos would be extra great if they weren’t submerged in the water or something 😉 their features would then be more prominent. Hwall Never said Jimin was his role model. They Just educated in the same academy. Hwall wrote in his profite that his favorite artistes are G-dragon and V.
He has said that he admires both. Don’t go getting mad because you’re misinformed about certain things. He is a fan of BOTH Jimin AND Taehyung. Please exit this page if you’re going to get mad. oh you calm down! I did not criticize this page, I just informed that this information is false so that it can be corrected. It is not false. IF you stanned the boys instead of coming on here from a twitter thread, you would know that he said he admired Jimin for his dancing. Next Caller!!!! I am sorry but how on earth was MissPerfectTae mad? I think she/he was just pointing out her/his thoughts, this doesn’t mean she is angry but trying to point out her/his own perspective of Hwall. And again if MissPerfectTae’s comment irritates you, just ignore it because at the end of the day, it’s really not worth fighting about. Kevin and Suggi (a youtube soloist+coverist) are friends. 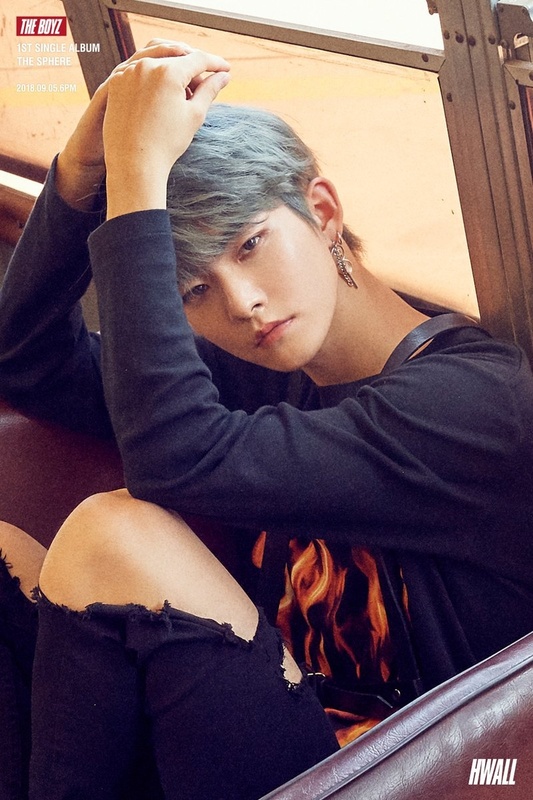 are we sure that hwall isn’t a main dancer too? he keeps getting dance stages + he’s seriously very good at doing it, so i just thought it’d be right to consider him one too. 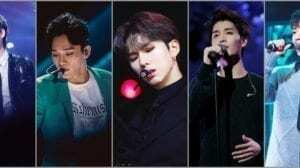 hwall’s father has recently passed away. 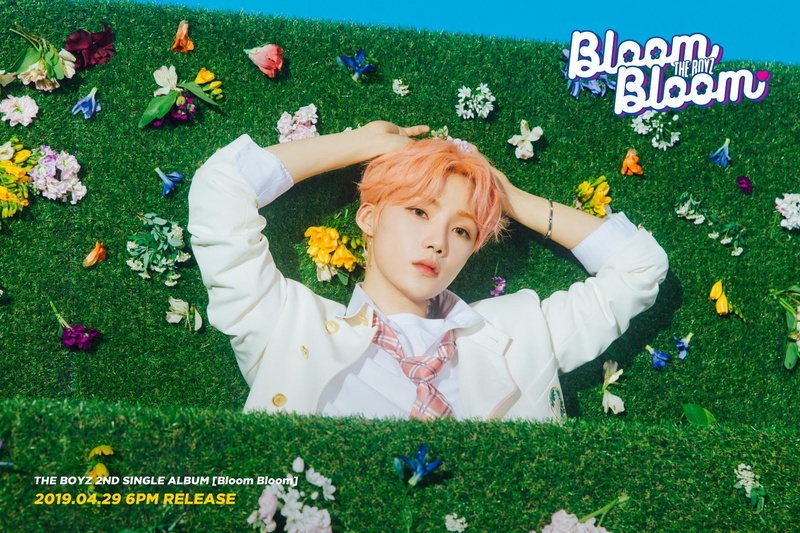 on february 4th, here’s the link to Creker’s post on it. 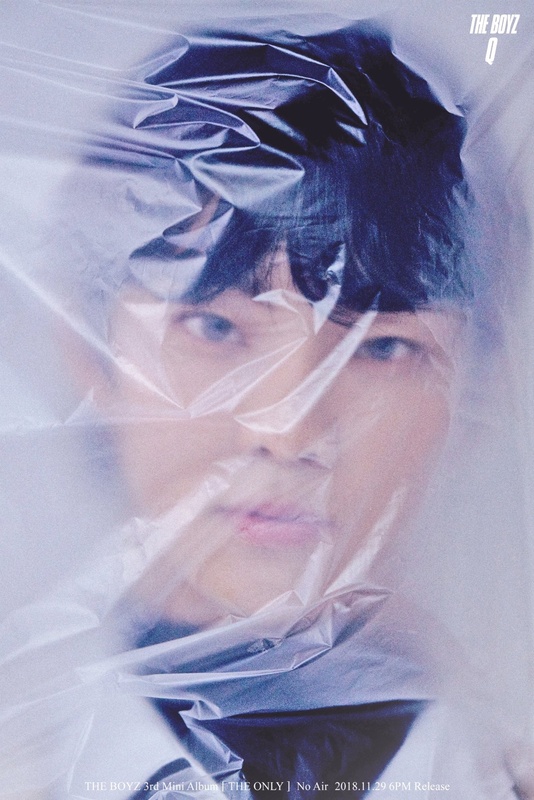 Why am I laughing at their concept in the photos?? It’s like I can feel those cold water in my ears…..
No…he’s said previously that he was born in Canada. 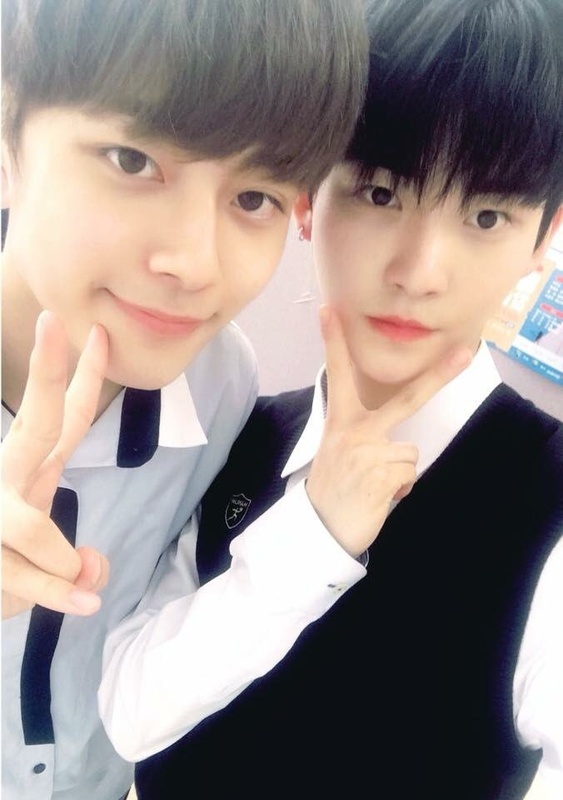 Sunwoo and Hwall have graduated from Hanlim! agreed, it’s not even a fact about him. 1) it’s really inappropriated to add about hwall’s father passing in his facts. please take it out. Guys can we like..not talk about the passing of any of their family members. It’s very rude and it’s not something that should be brought up. So please take the one about Hwall’s father off the website.. I agree, we should respect their private lives and family. uh no he’s not- where did you hear that from? 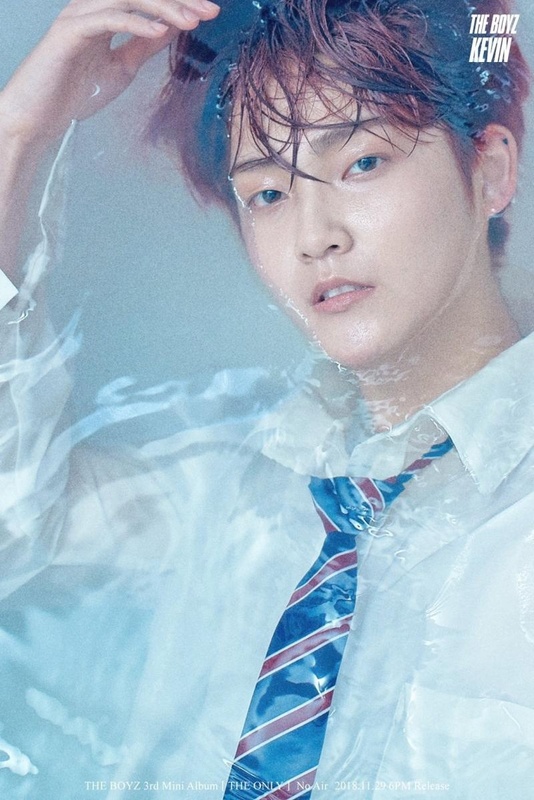 (By the way Hwall is my Bias) OMG! I didn’t know he lived in my home country (Philippines) for 4 years!!! WAHHH!! !